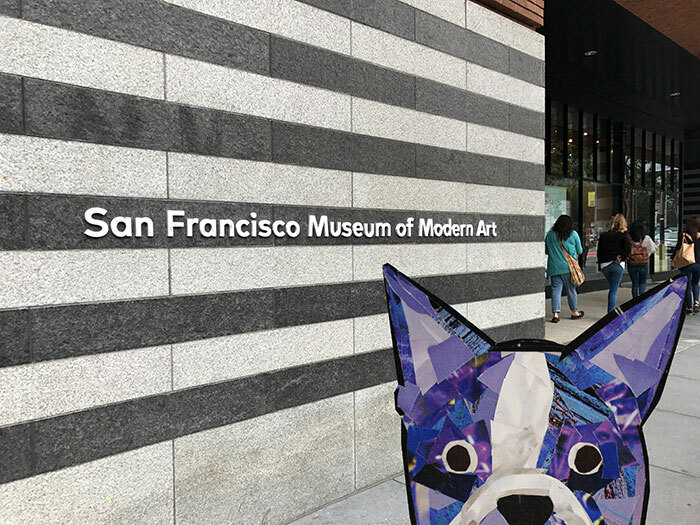 While visiting San Francisco, Bosty decided to check out the San Francisco Museum of Modern Art. 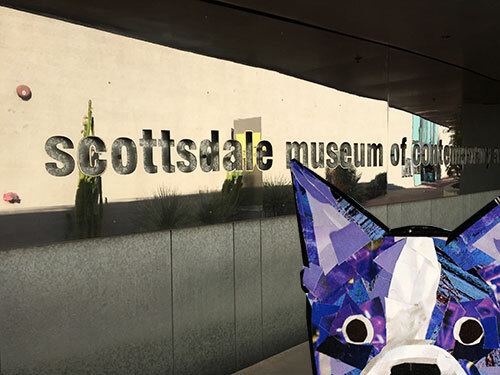 He especially wanted to see the Matisse and Diebenkorn exhibit. 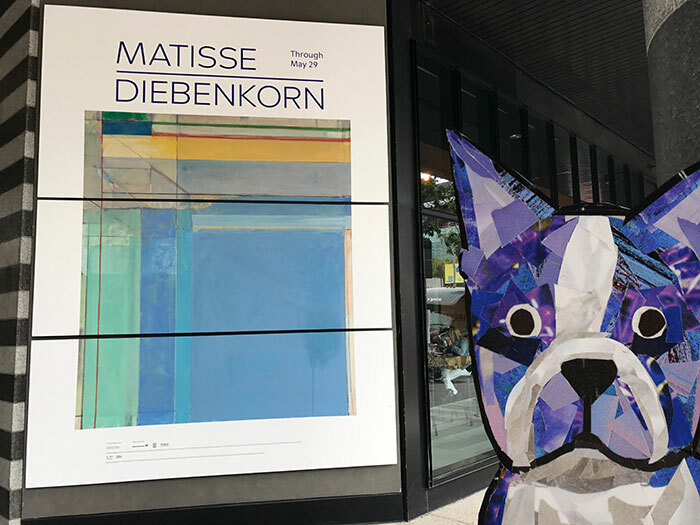 So right after he bought his ticket, he went straight to the Matisse and Diebenkorn show. 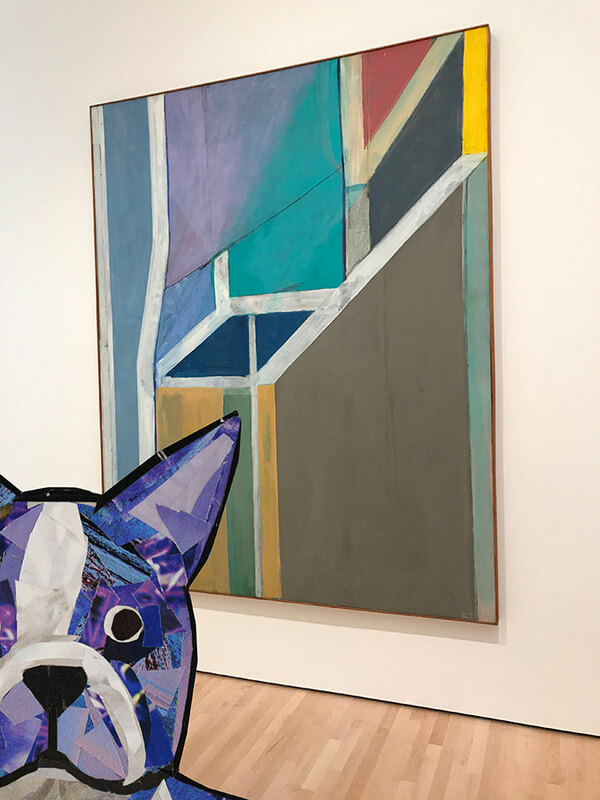 Wow, just look at those bright, beautiful colors that Diebenkorn used! 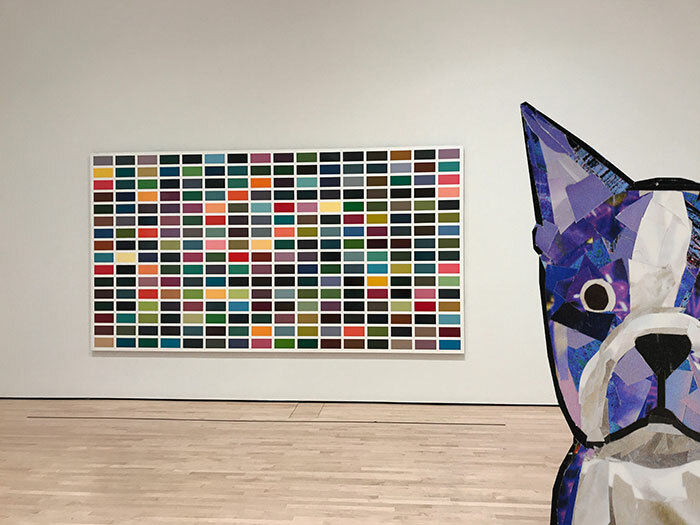 Next, Bosty wandered around the permanent collection for hours. 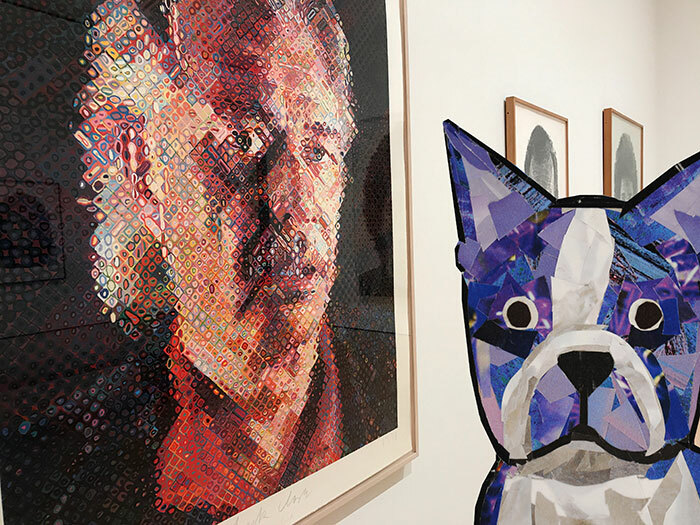 He loved seeing some of Chuck Close’s intricate portraits. 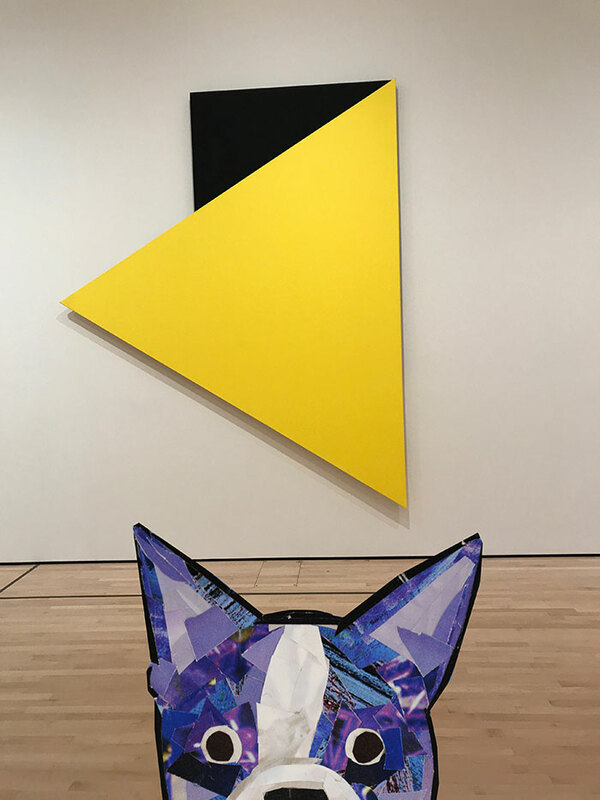 And Ellsworth Kelly’s bright, abstract paintings were another favorite, especially the painting that looked like painted pixels. 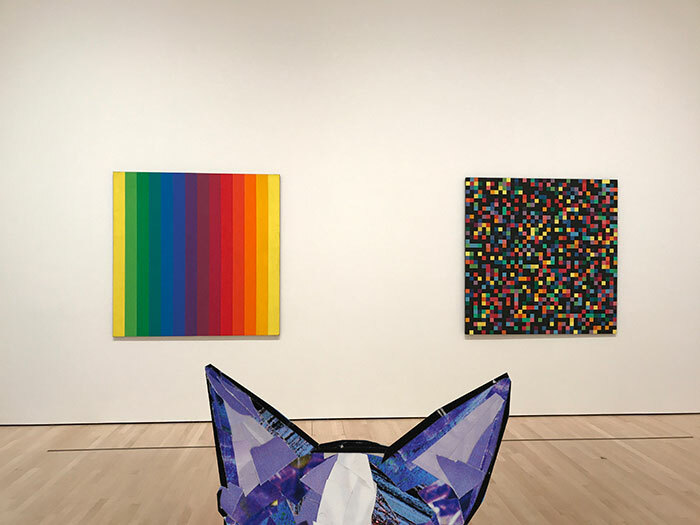 He also liked Ellsworth Kelly’s large, abstract paintings on panel. 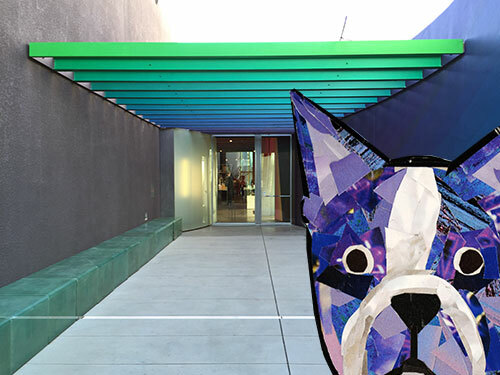 Bosty enjoyed seeing all the geometric minimalist work. 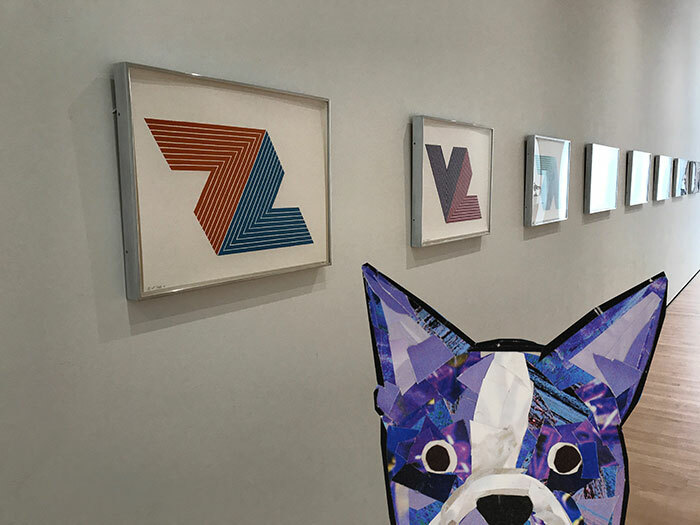 He saw several pieces by Frank Stella that he just had to have his picture taken by. He was also surprised to see that Gerhardt Richter had made some colorful, minimalist paintings. And Bosty liked seeing some of Gerhard Richter’s work in his usual style. 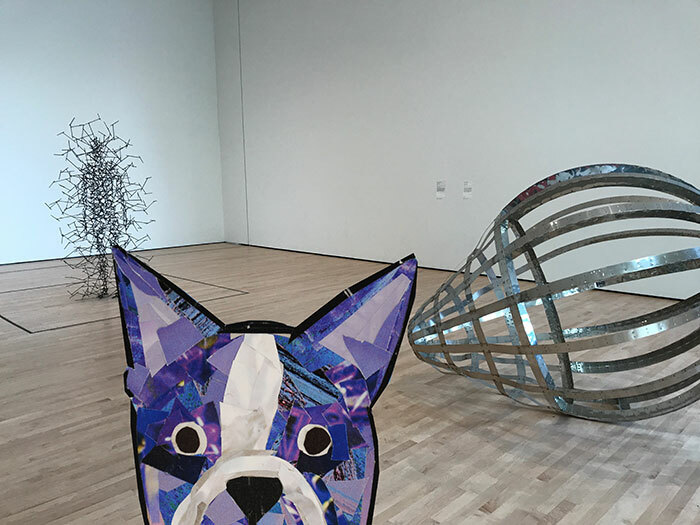 There were some pretty interesting sculptures in the museum too, like Antony Gormley’s “Quantum Cloud VIII,” which conveyed the body as a swarm of chaotic energy, and Richard Deacon’s “For Those Who Have Eyes,” which was a bulb shape based on the anatomy of the human eyeball. Gunther Forg’s colorful, minimalist pieces were also fun to study for a while. Bosty really liked Roy Lichenstein’s comic book style art, since it was like looking at life-sized comics. 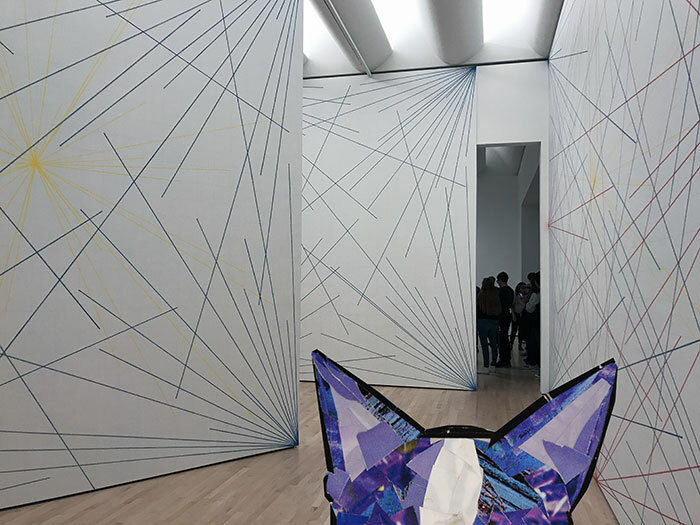 Bosty ended his visit by walking by Sol LeWitt’s installation art. The simplistic lines and shapes were pretty amazing to see. 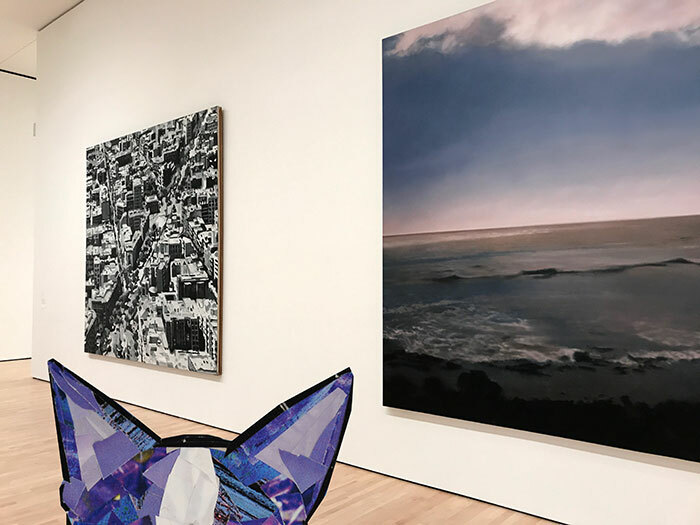 Overall, Bosty’s museum visit inspired him to want to visit more museums when he heads home to DC. 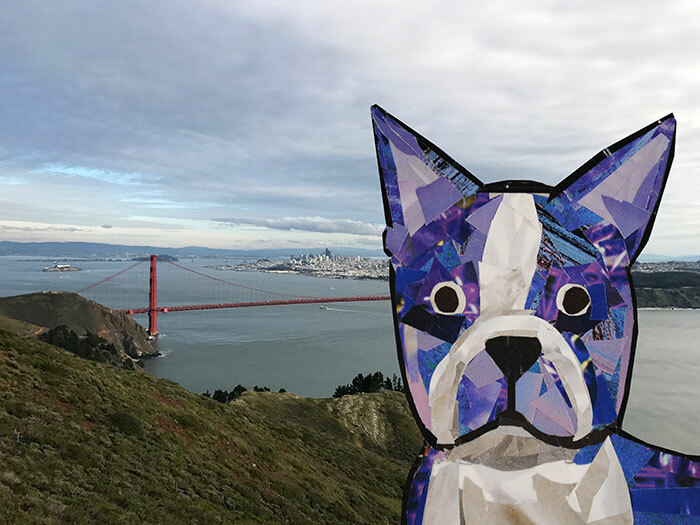 Bosty went to San Francisco again so he could escape the humidity on the East Coast. 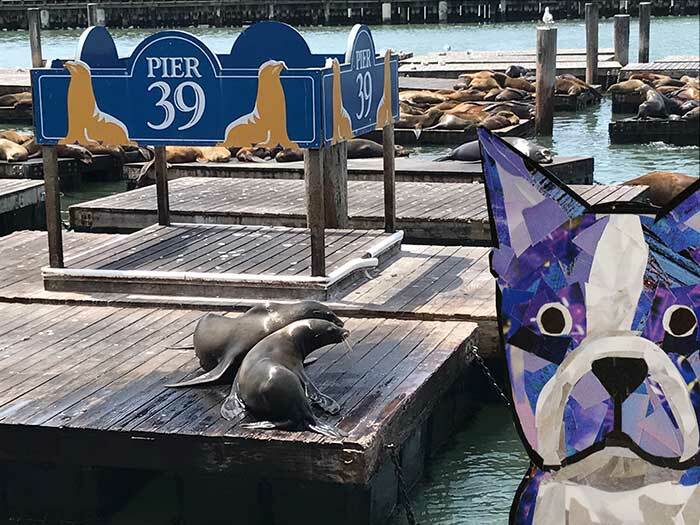 He decided to start his trip off by visiting the seals at Pier 39. 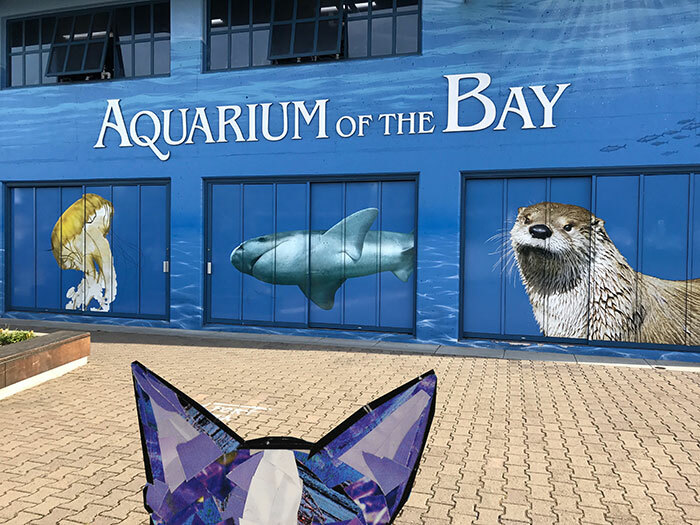 Then he stopped by the Aquarium of the Bay to see all the underwater creatures. He’s always curious about what other critters look like. 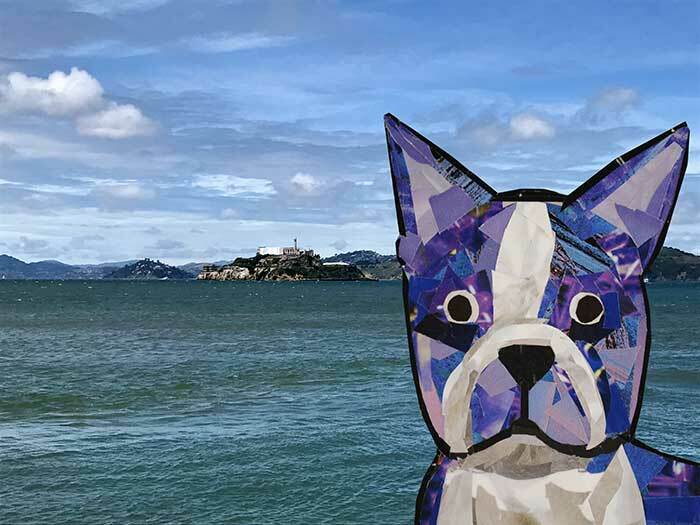 Next, he strolled around outside and got to see Alcatraz Island in the distance. 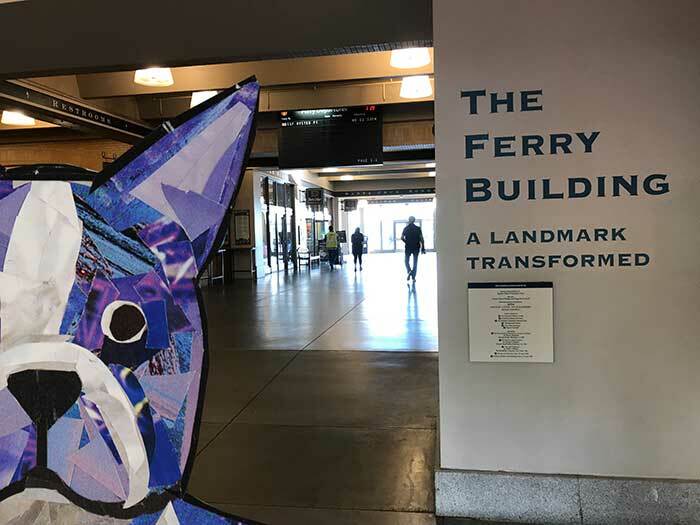 Then he walked along the Embarcadero, where he stopped by the huge Ferry Building. There were all kinds of food stands to take a look at. It sure made Bosty feel hungry! 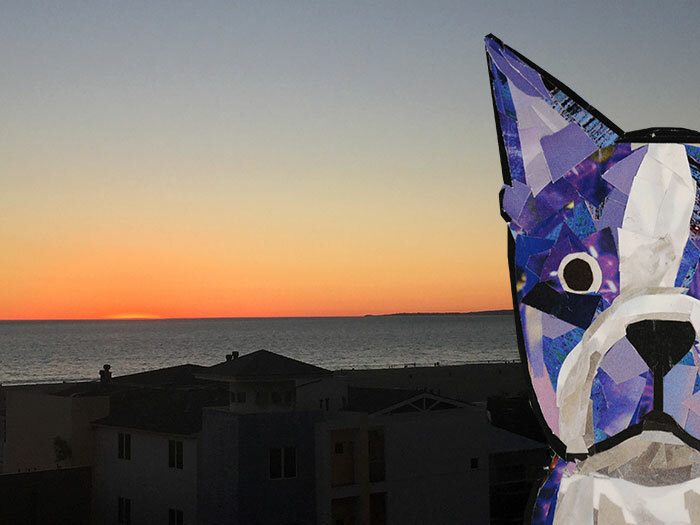 At the end of the day, he sat back, relaxed, and enjoyed the view of the bay. The sun looked beautiful as it was getting ready to set. 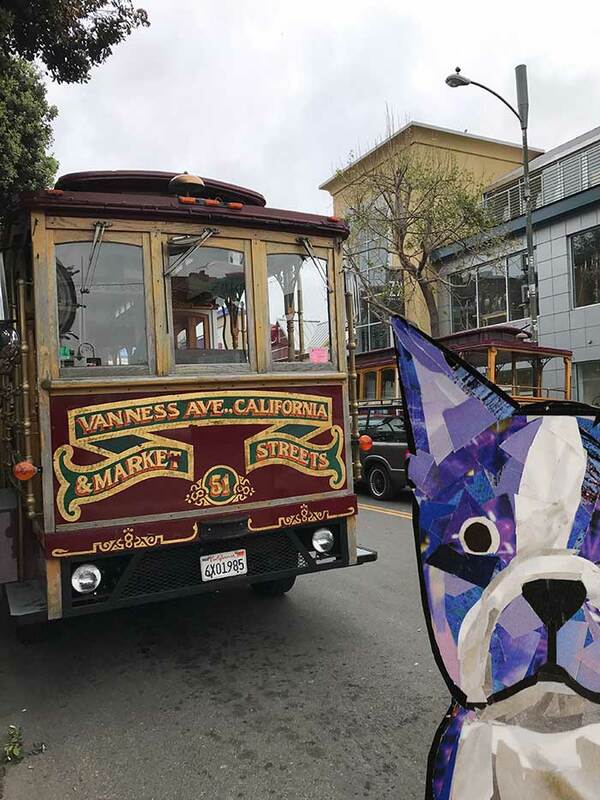 The following day, he got to ride a trolly car across town. 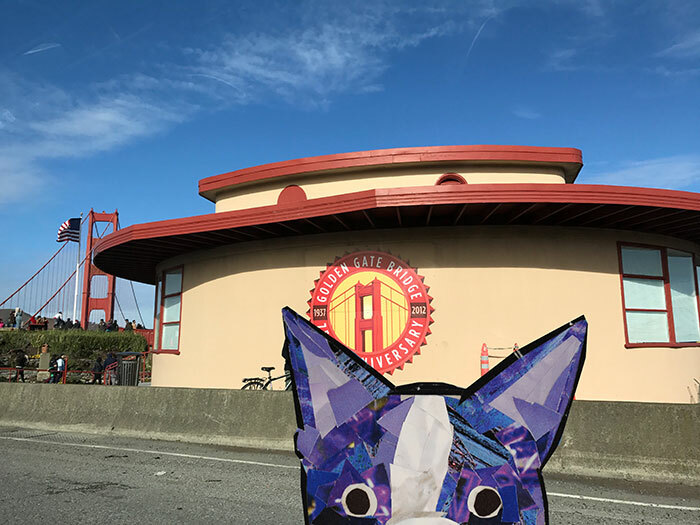 And after being lazy on the trolly, he just had to hike across the Golden Gate Bridge again. Just look at those views! Next, he rode one of the cable cars across town to see the San Francisco Zoo. 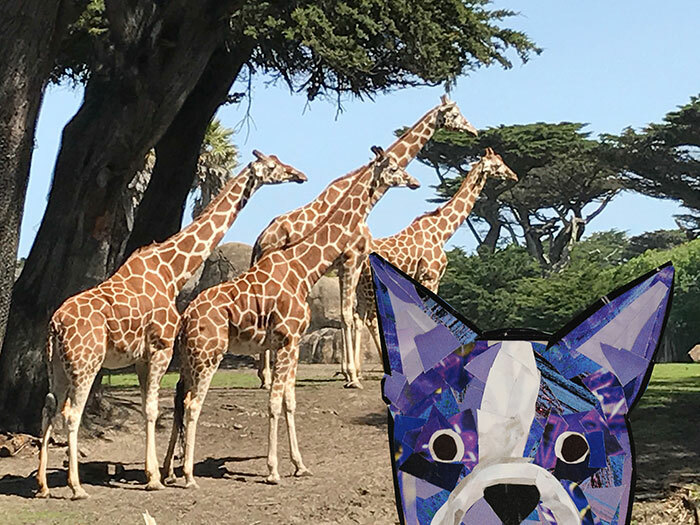 He was really excited to see all the giraffes there, but didn’t know what they were looking at just now. Are you trying to find me? I’m right here! 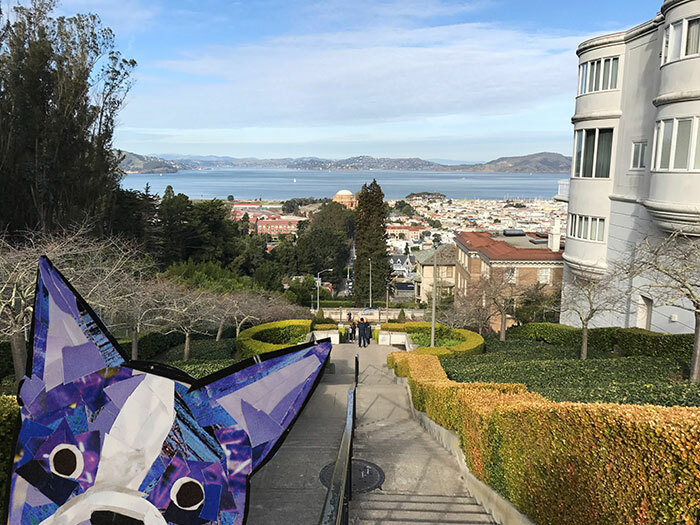 After wandering around the zoo for a few hours, he walked up the 16th Avenue Tiled Steps to enjoy the gorgeous view of the city. But why stop there? 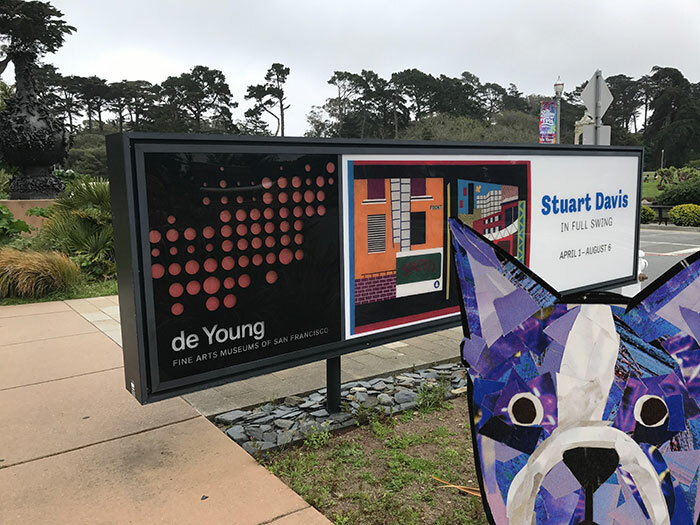 Bosty wanted to take a look at a few museums, so he stopped by the de Young Fine Arts Museum to see the Stuart Davis exhibit. 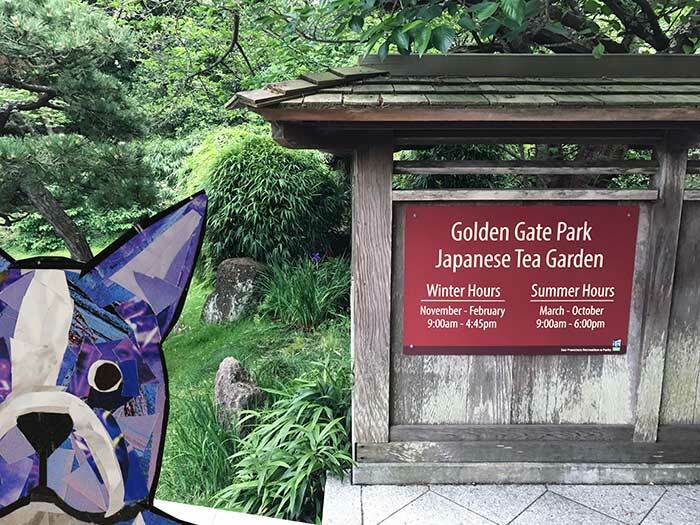 And since he was so close to the Golden Gate Park Japanese Tea Garden, he figured he might as well take a look at all the beautiful plants and flowers there. He ended his excursion by heading over to Ocean Beach . 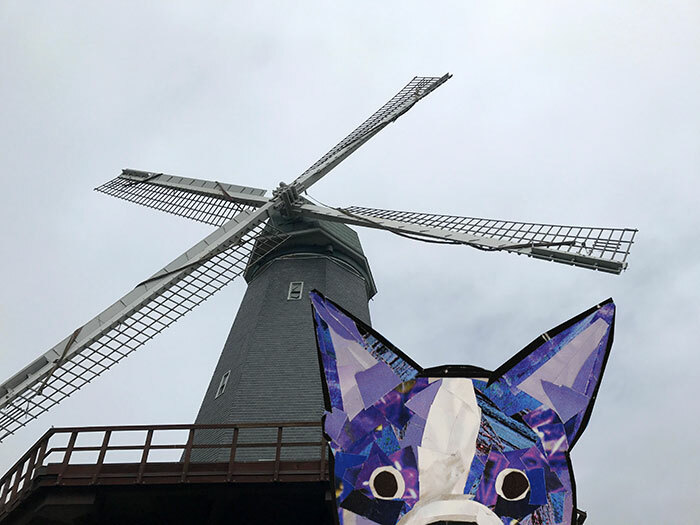 He noticed that he could see one of the Golden Gate Park windmills from the beach, and just had to get his picture taken in front of it. 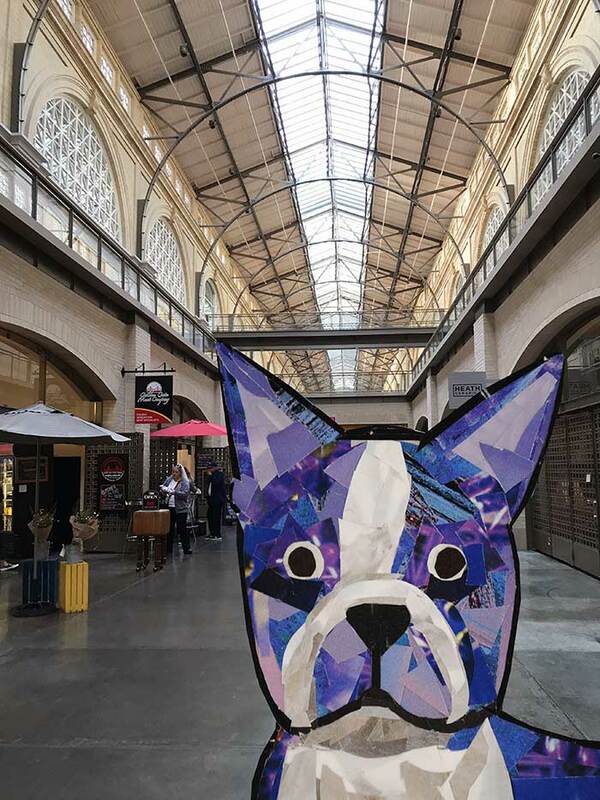 Overall, he had one exciting West Coast visit. And he was pretty exhausted after checking out so many touristy places in the city. 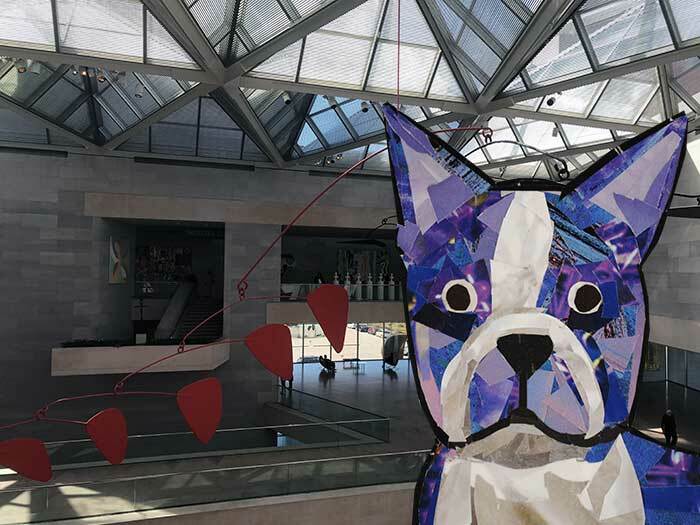 Bosty wanted to explore one of the museums in the Washington, DC area, so he decided to stop by the National Gallery’s East Wing. 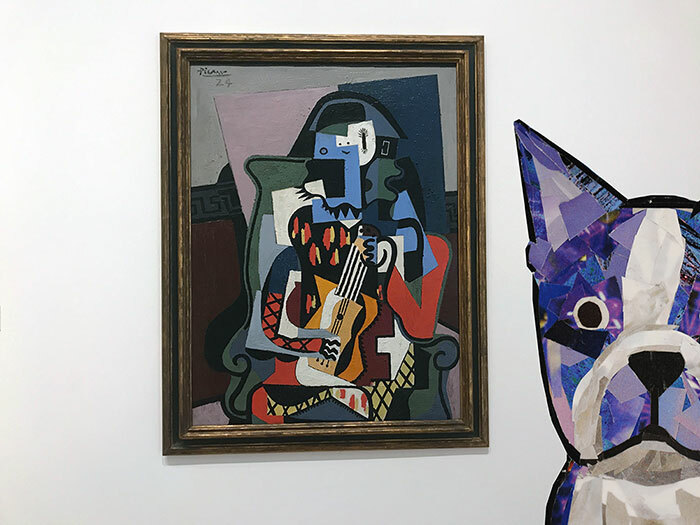 He was excited to see artwork by famous artists like Pablo Picasso. 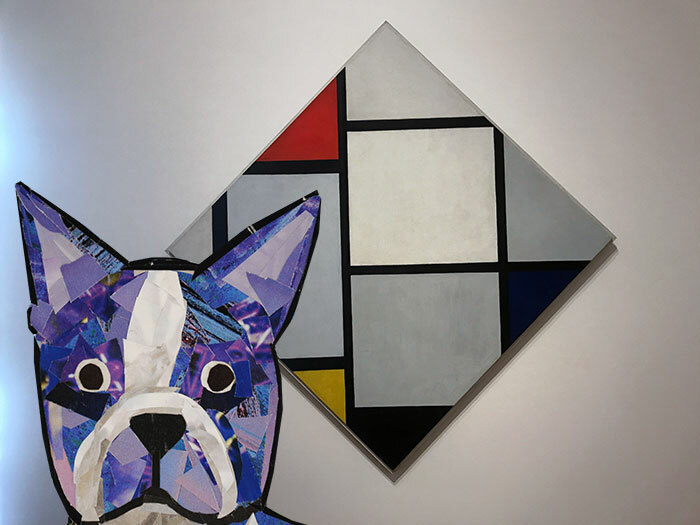 As he wandering around the museum, he was drawn to Piet Mondrian’s simple geometric shapes and bold colors. 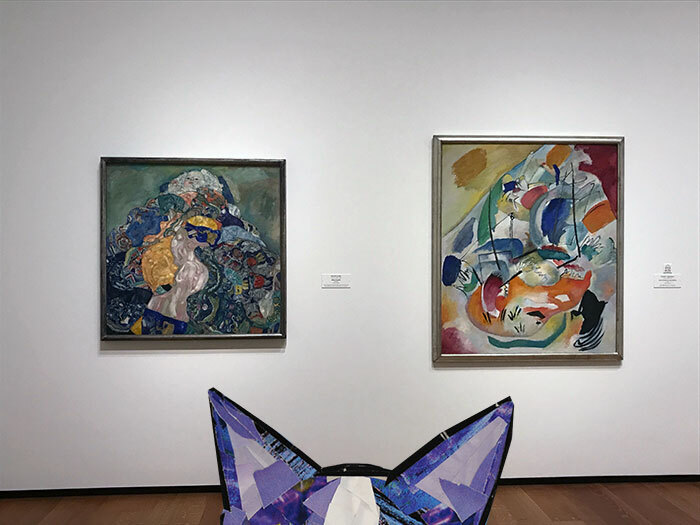 Wassily Kandinsky’s colorful abstract work also caught his eye, and he enjoyed seeing one of Gustav Klimt’s figurative and patterned paintings. 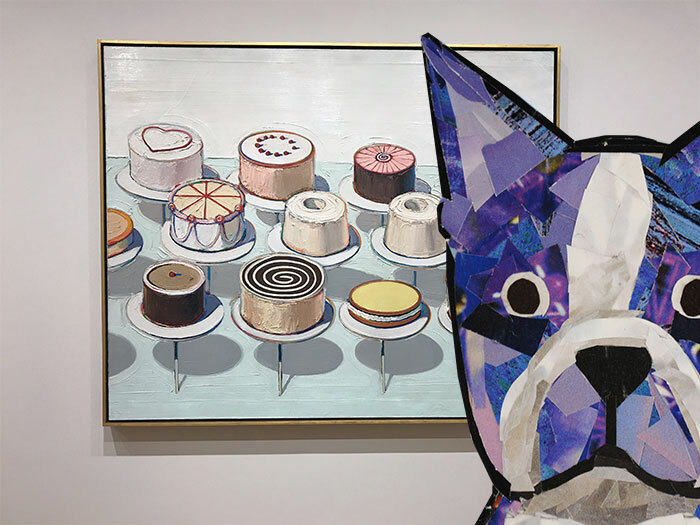 Wayne Thiebaud’s cake painting made Bosty feel a little hungry. Cake, anyone? 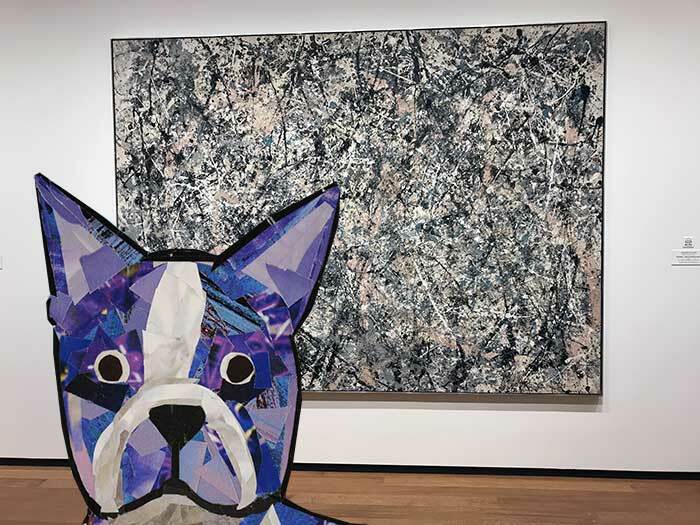 He spent a little time staring in awe at one of Jackson Pollock’s large paintings that was part of the Abstract Expressionist movement. 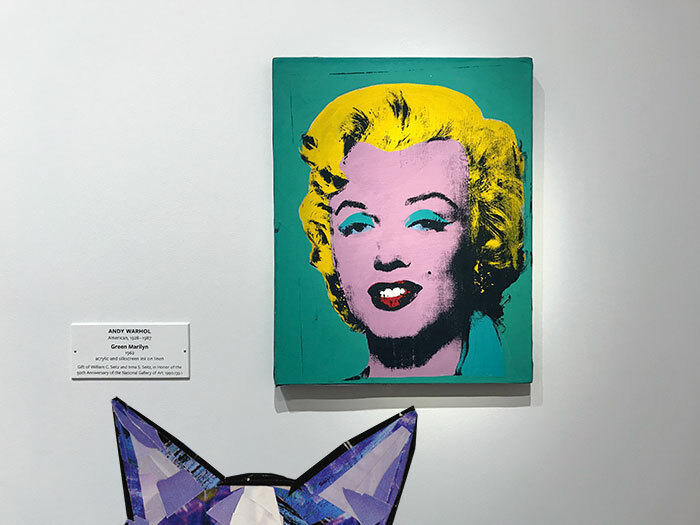 Wow, is that an Andy Warhol? 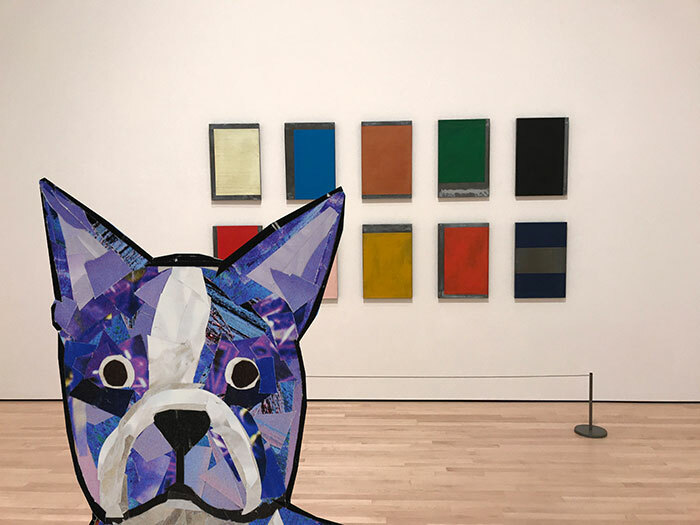 Bosty is a big fan of pop art. 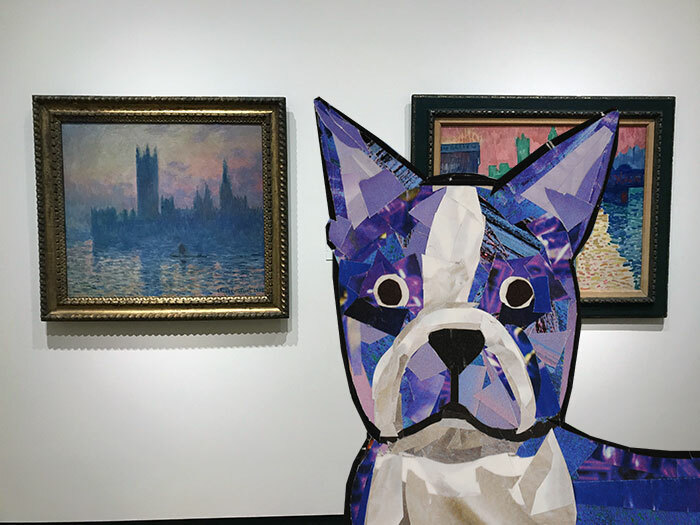 He also enjoys Impressionist paintings, and was excited to see some work by Claude Monet. 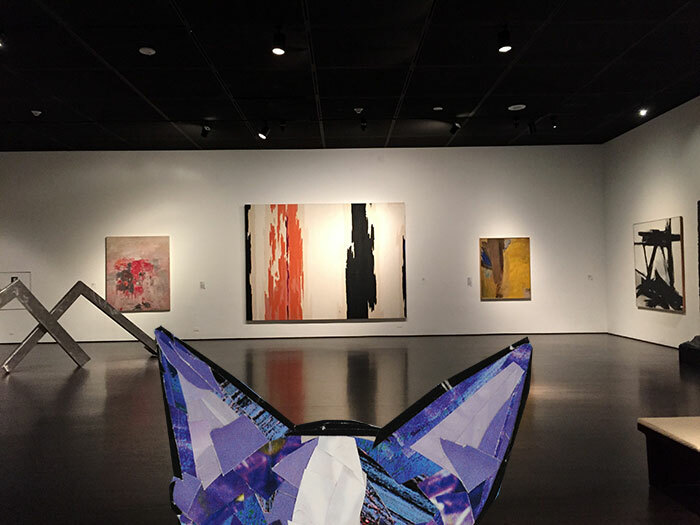 Bosty took a final look around and enjoyed seeing Alexander Calder’s large mobile pieces. 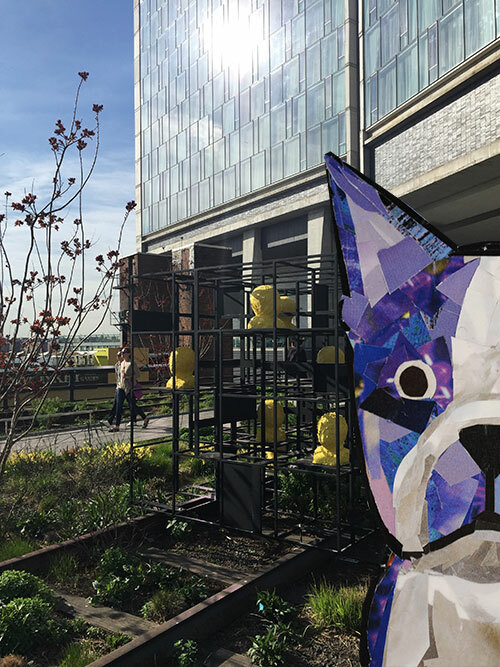 He was a little worn out from wandering around every floor of the museum, so he went outside to enjoy the sunny spring weather. 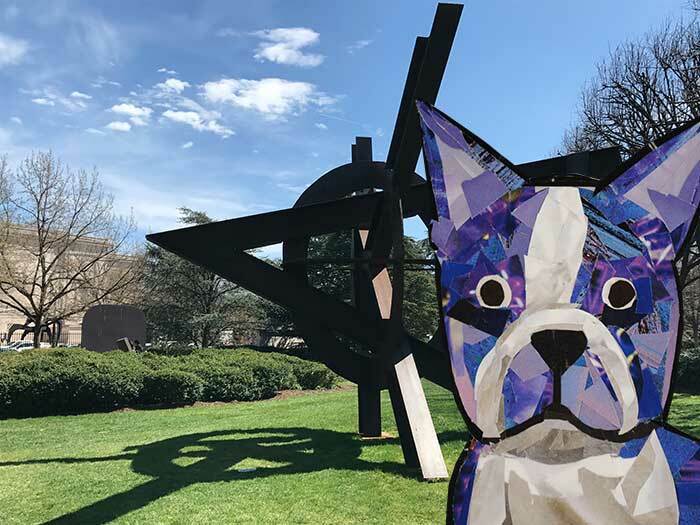 Before leaving the National Mall, he strolled around the National Gallery’s Sculpture Garden. 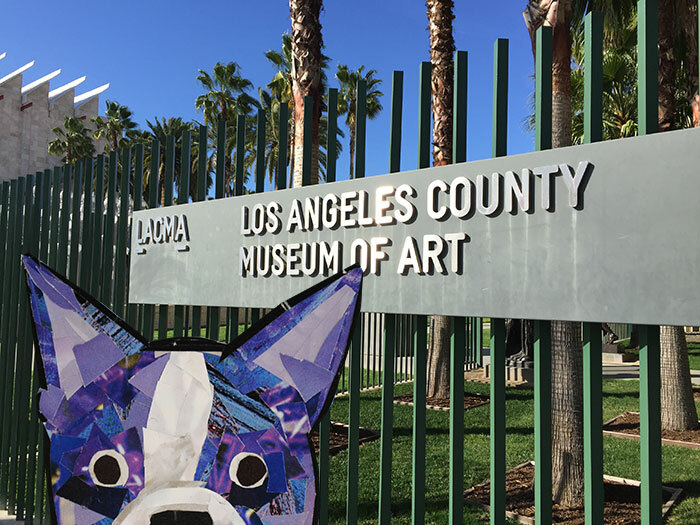 It was a beautiful day outside, and it was a wonderful day to see some colorful works of art. 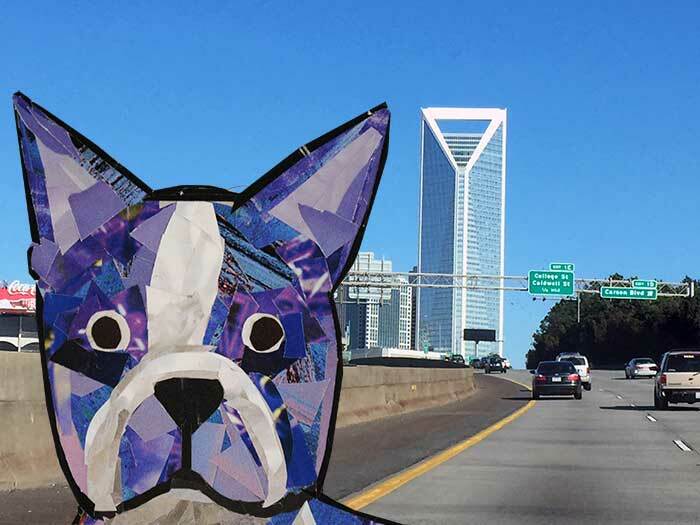 This past weekend, Bosty decided to explore the outdoors by heading off to Charlotte, North Carolina. 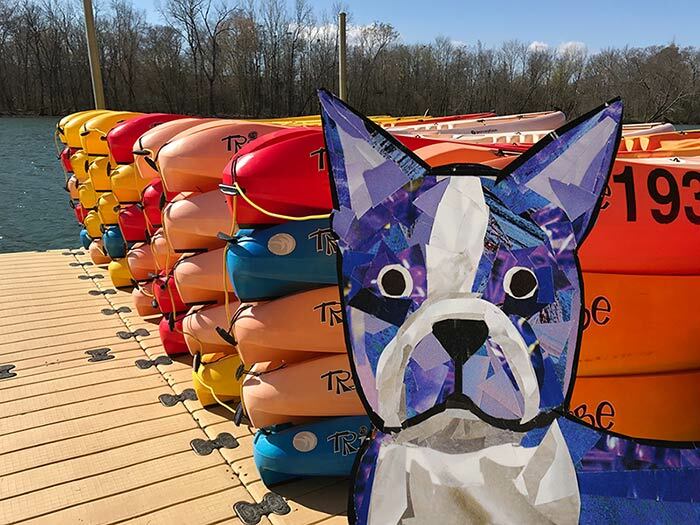 He was anxious to escape the city and get more in touch with nature – so he started off his trip with some kayaking. 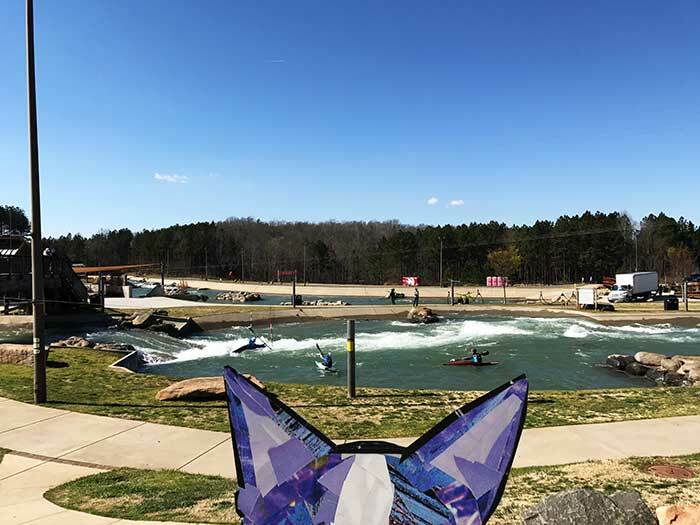 When he was tired of kayaking on his own, he decided to watch others paddle in the water, enjoying the sunny weather and blue skies. 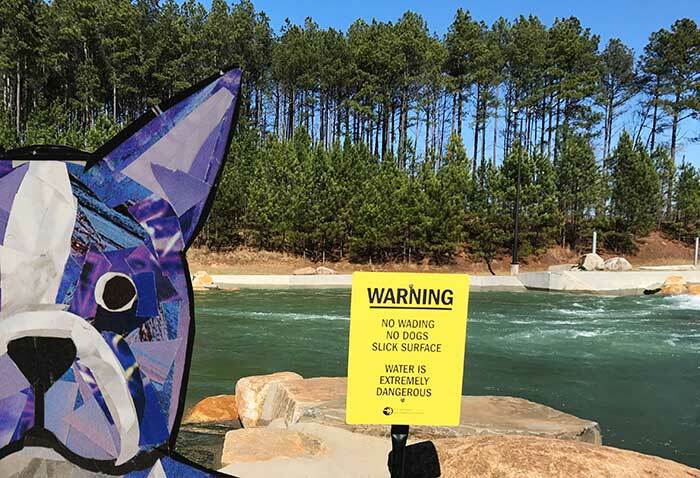 Later he strolled around the park and noticed that a sign said that dogs weren’t allowed in the area – oops! So he wandered away from the signage and into the woods to get some exercise hiking. He loved running around all the trees and kicking up some dust in the trails. 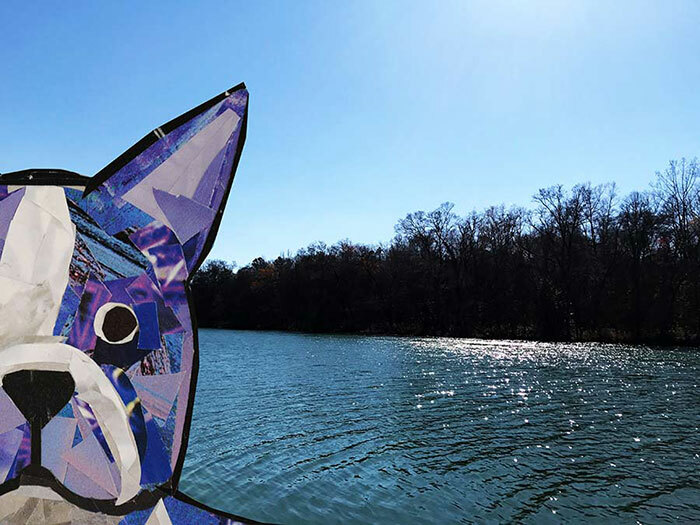 After a long day of hiking around, he took an afternoon break by the water to enjoy the cool breeze and gaze at the beautiful river. 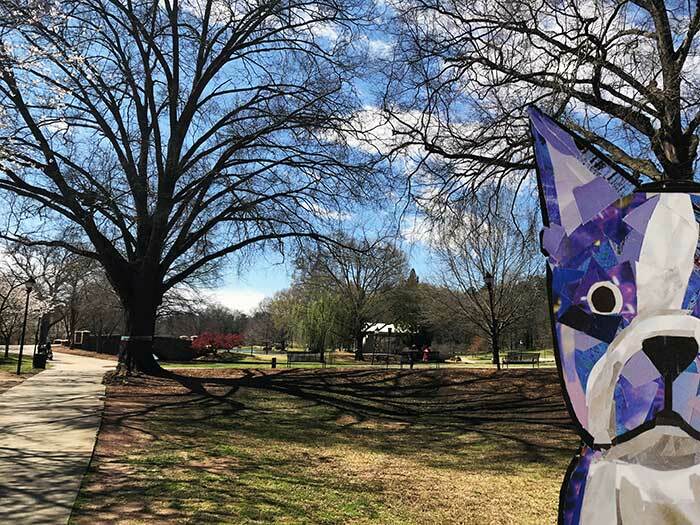 Later he went for a stroll and admired the landscape in another local park. “It’s beginning to look a lot like spring!” he thought. 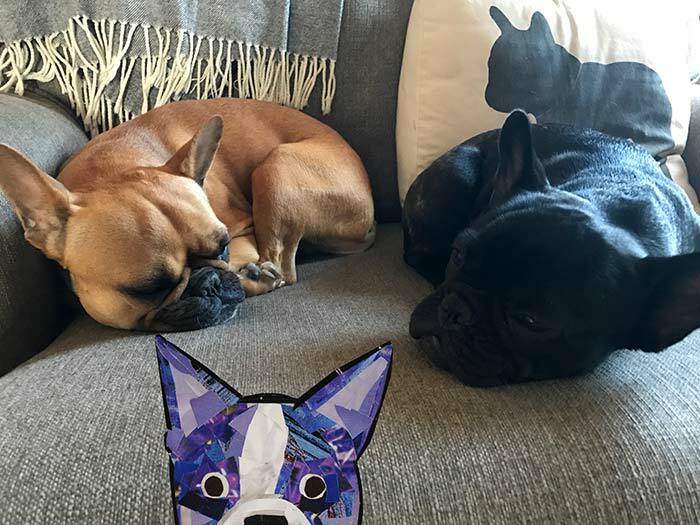 By the end of the day, he was completely exhausted, so he took a nap with a couple new friends he made, the French Bulldogs Maddie and Brady. 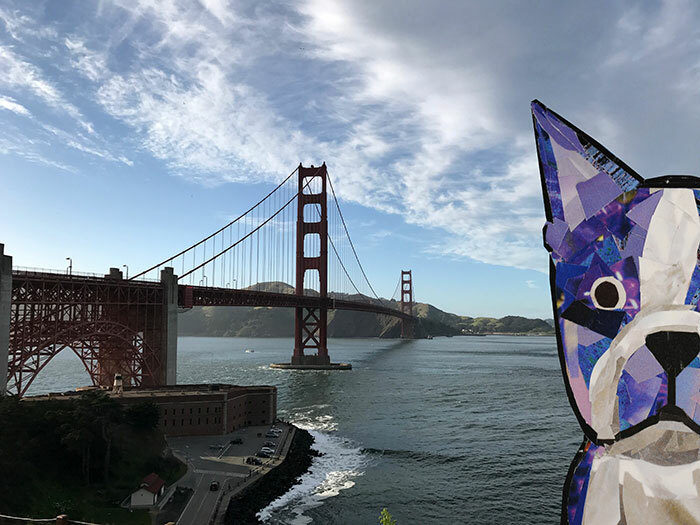 Bosty realized it had been way too long since his last adventure, so he decided it was time to head to San Francisco to check out the West Coast. 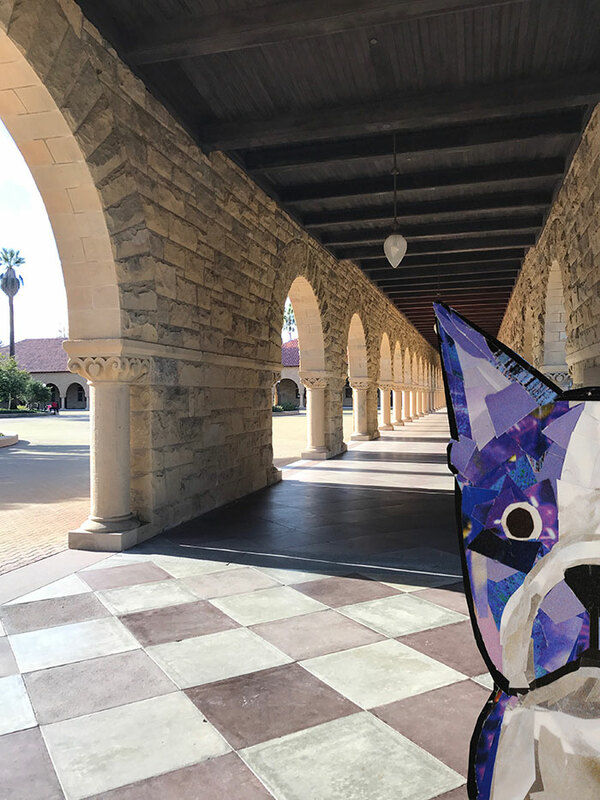 He also wanted to explore other places in the area, and his first stop was Stanford University. 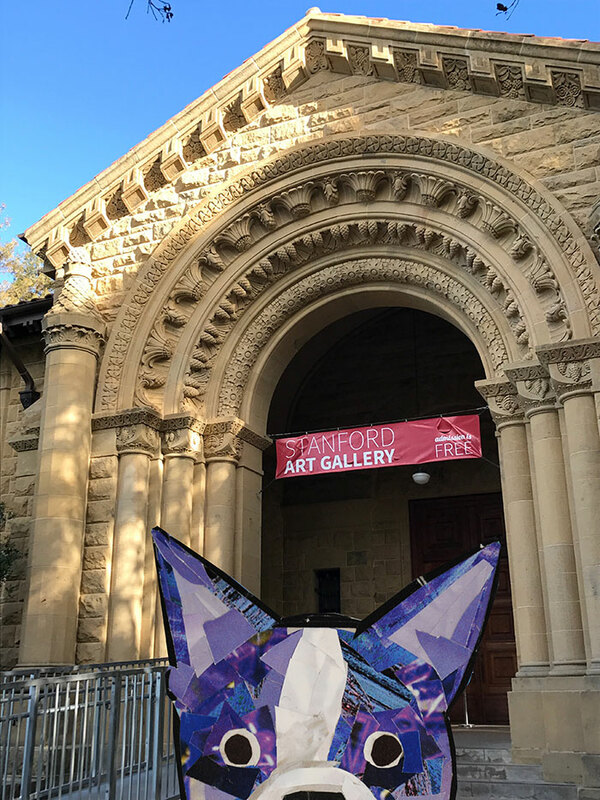 Don’t forget to check out the latest exhibit at the Stanford Art Gallery! 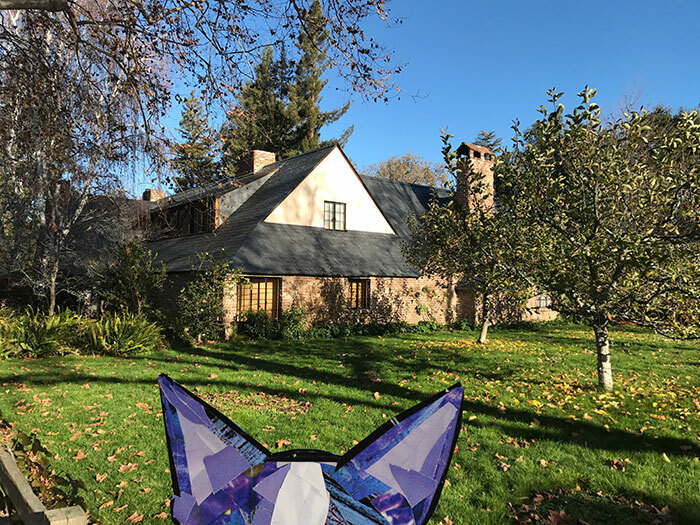 After making it all the way over to California, he figured he might as well visit the house where Steve Jobs, the mastermind behind Apple computers, used to live. Are those apple trees out front? 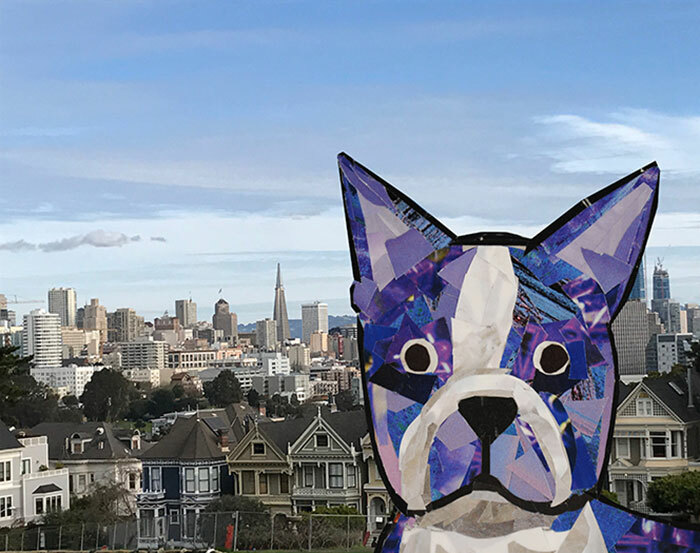 Finally he headed to San Francisco to take a look at the view of the Painted Ladies, which are a row of houses that are painted in several bright colors. He had to see them since they’re famous – they were on an old TV show called Full House. 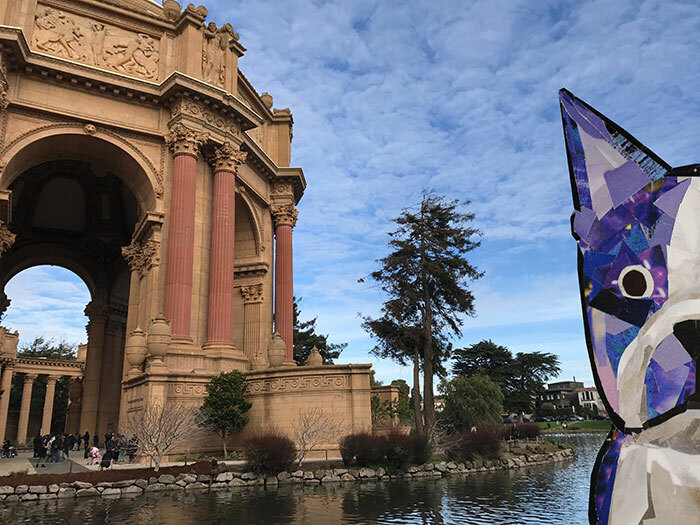 Next he wandered over to the Palace of Fine Arts so he could see even more beauitful architecture. He couldn’t get over how huge the arches were! Bosty still wasn’t done walking all over the place. 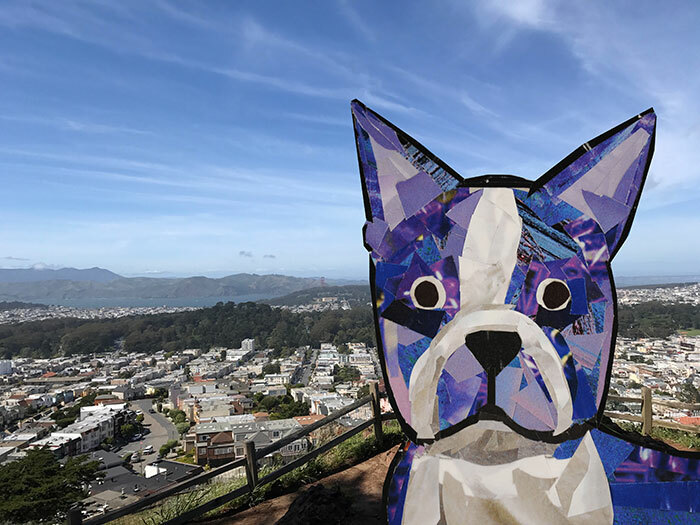 He wanted to hike across the city to take a look at the view from the Lyon Street Steps. Up next? The Golden Gate Bridge, of course! After walking across the bridge, Bosty wanted to hike far enough away to get a great picture of it. 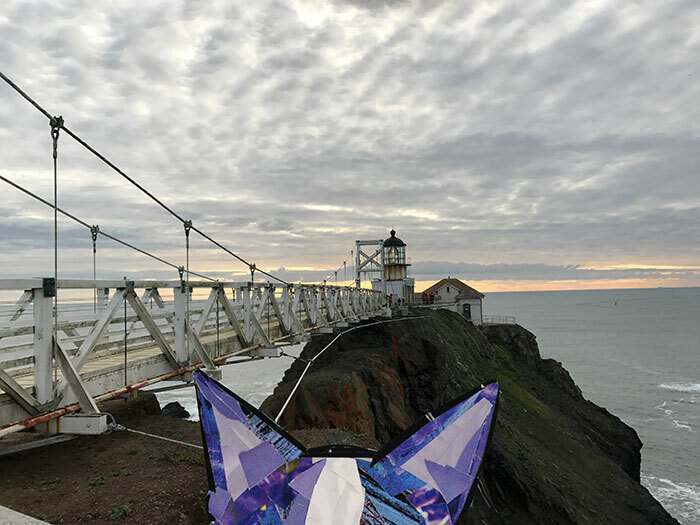 Then he walked over to the Point Bonita Lighthouse – just look at that view! 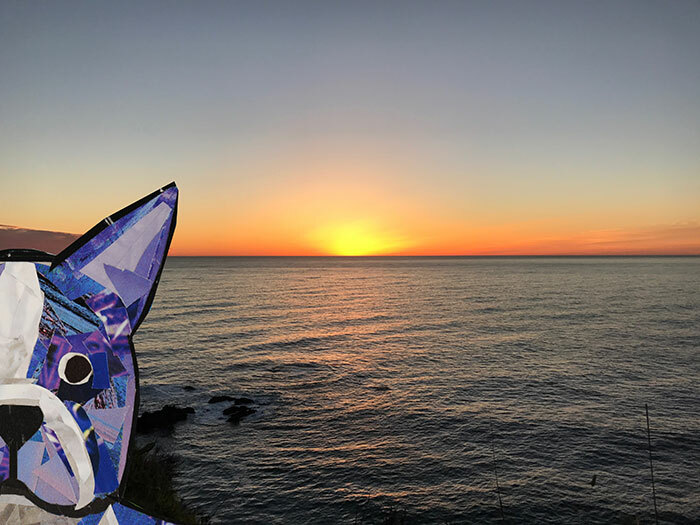 He decided to watch the sunset and then call it a day. The following day he travelled along the coast so he could get plenty of pictures of the ocean. 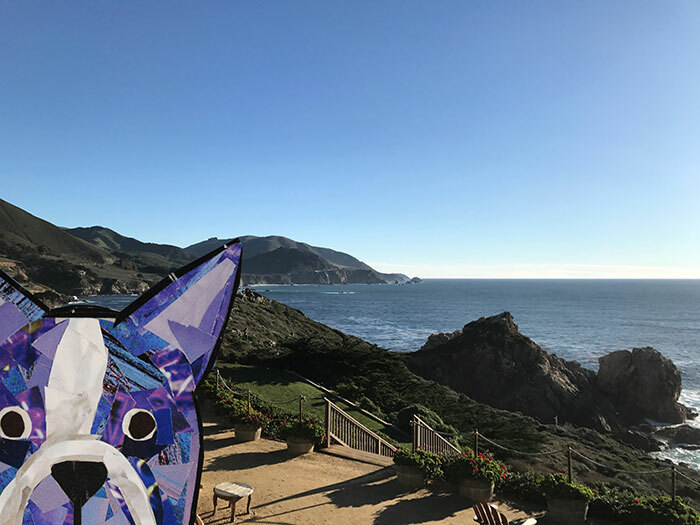 He definitely took plenty of pictures of Big Sur – which is a stretch of California’s coast between Carmel and San Simeon. All morning and afternoon he wandered around gazing at nature and the water. 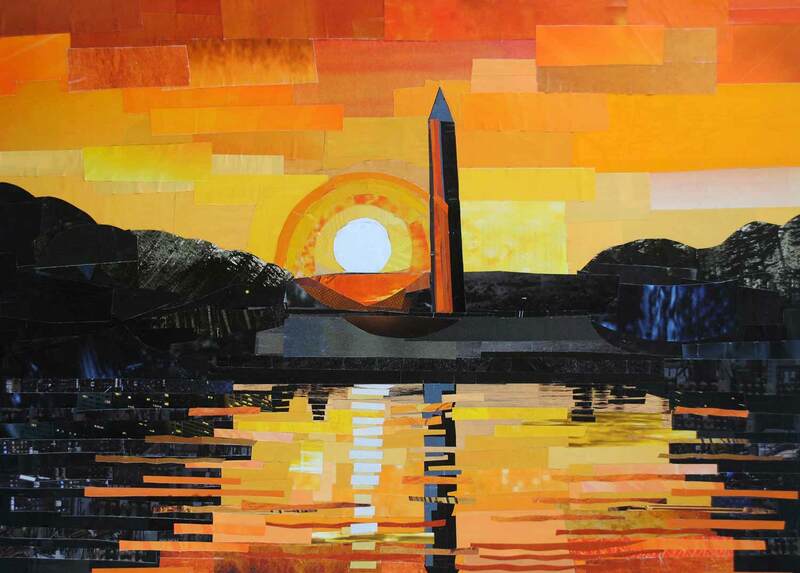 So when evening slowly approached, he knew he’d have to wait to see the sunset on the water. For the night, he decided to tour Hearst Castle, and take a look at the lavish home where William Randolph Hearst lived. There were so many different types of antiques and works of art to look at! 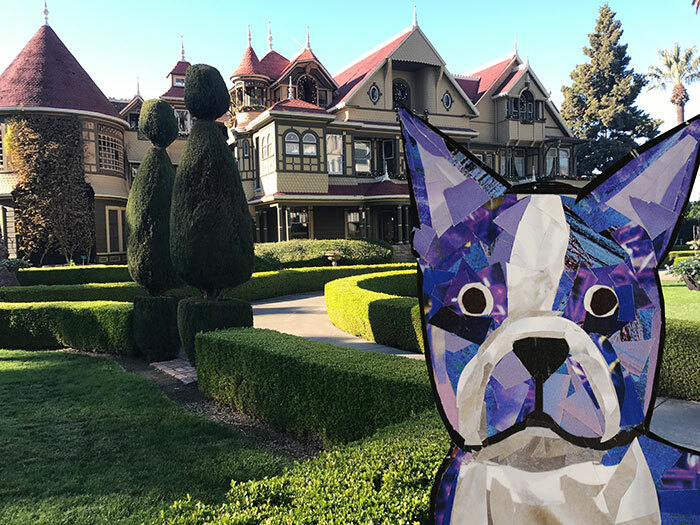 The following day he toured the Winchester Mystery House in San Jose – another large building that seemed to have it’s own fair share of unusual tales and theories. 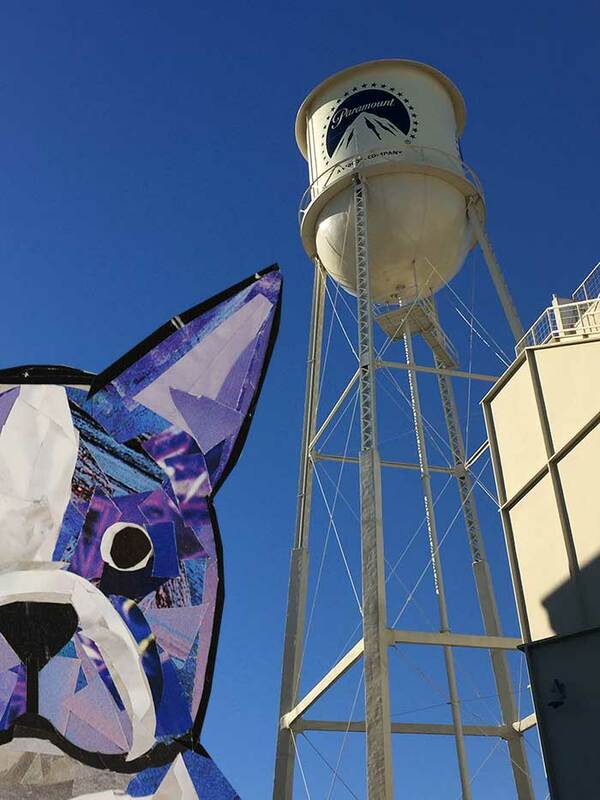 Bosty decided to take a break from the DC winter by heading off to Los Angeles, California. 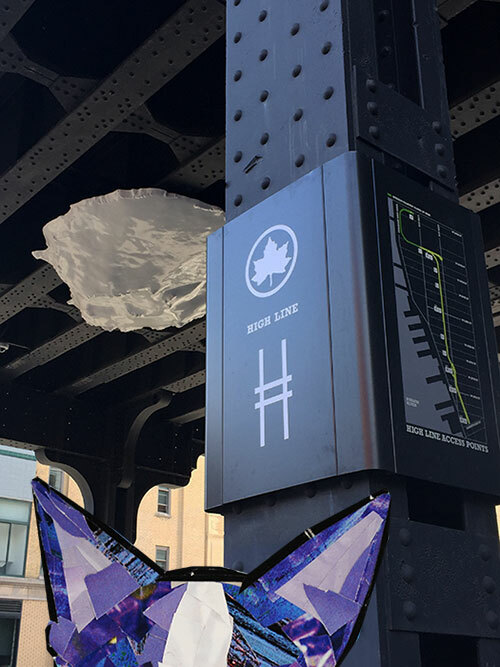 His first stop? 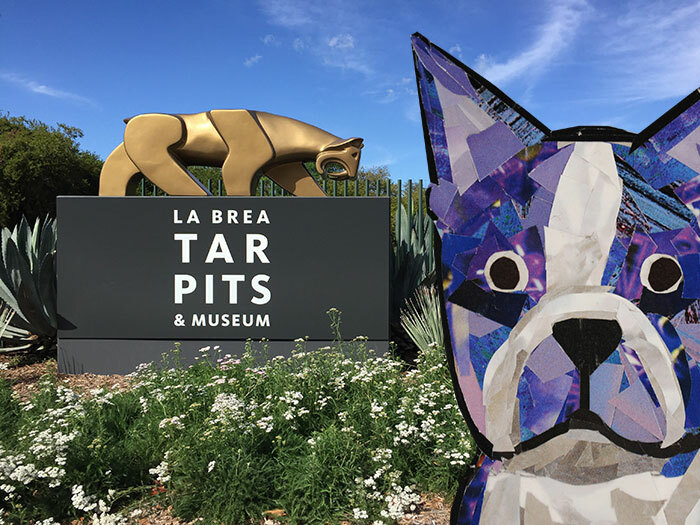 The La Brea Tar Pits where he could truly blend in as a tourist. 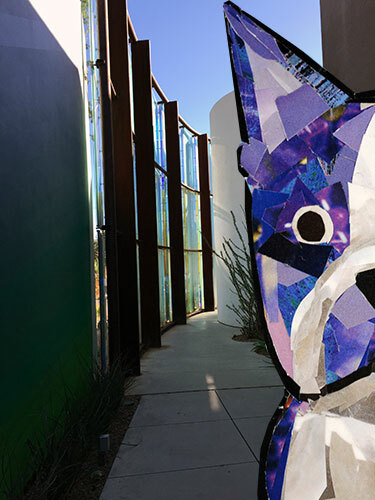 Then he headed next door to the Los Angeles County Museum of Art to see the Frank Gehry exhibit. 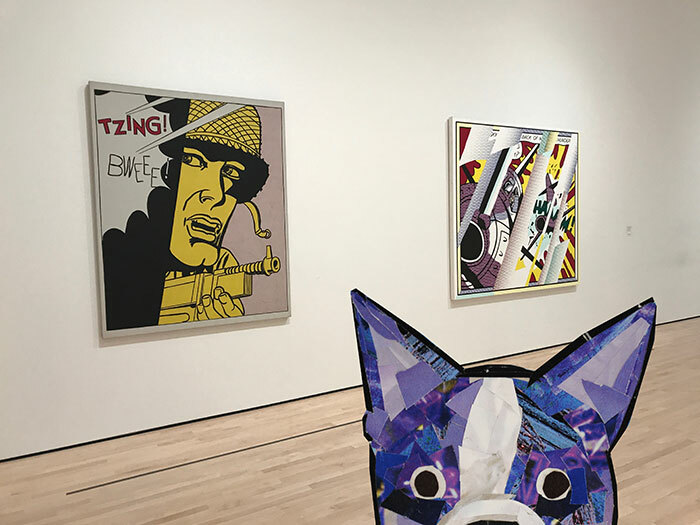 He also wanted to take a look at all the modern art – especially the Abstract Expressionist art! 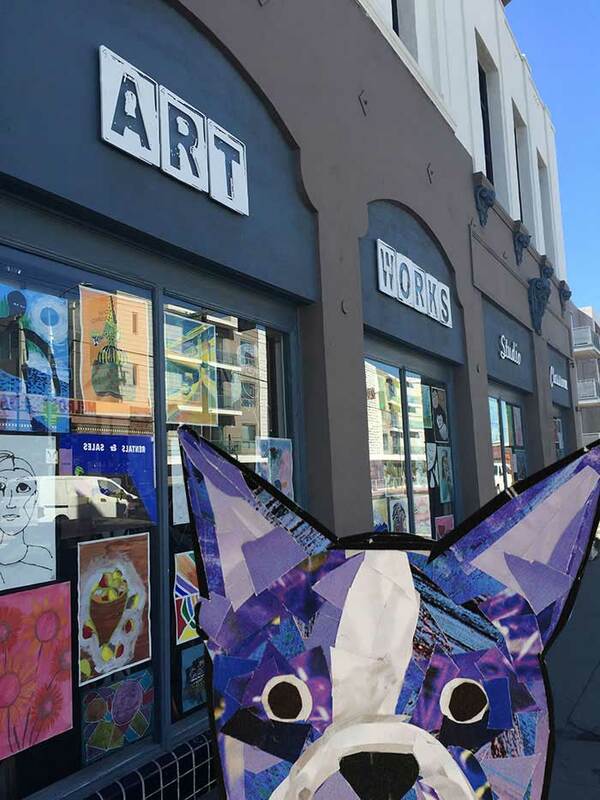 Then he decided to wander around LA, checking out some of the antique and artsy stores. Art Works Studio? 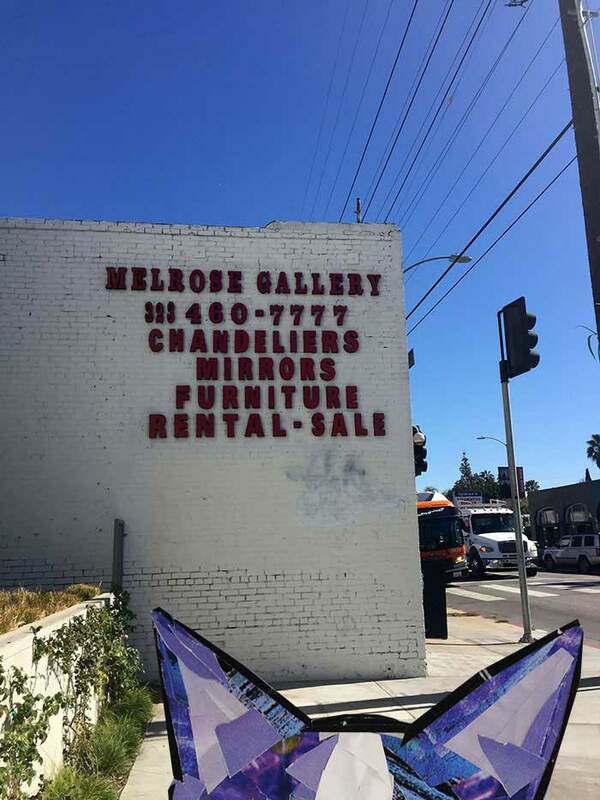 He was definitely a fan of that gallery and its clever name. 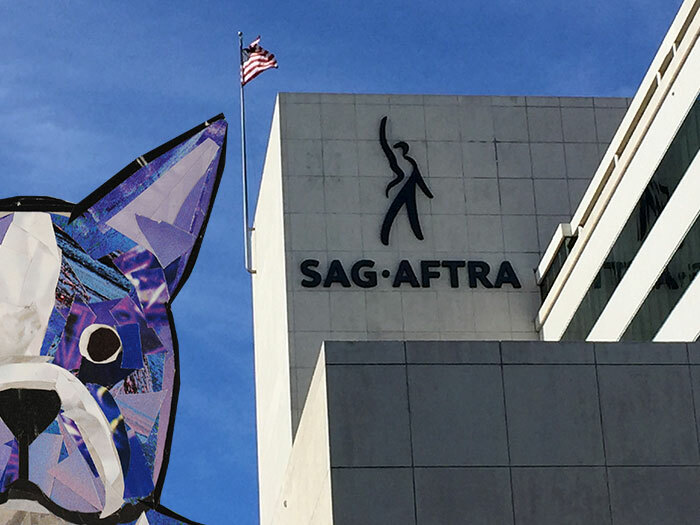 Later he popped over to SAG AFTRA in hopes that by posing by the building, he could automatically become a SAG actor. Sorry, Bosty. It doesn’t quite work that way. 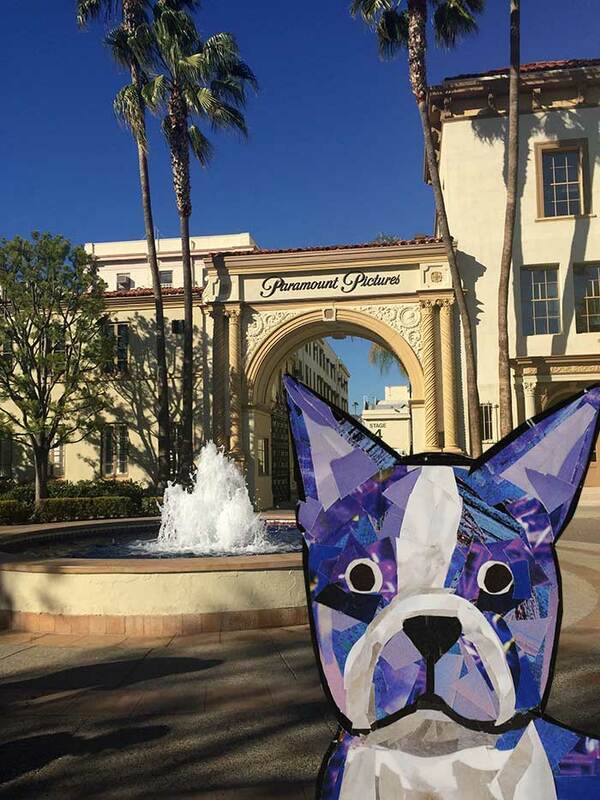 And by the Paramount Pictures sign, with plenty of palm trees in view. 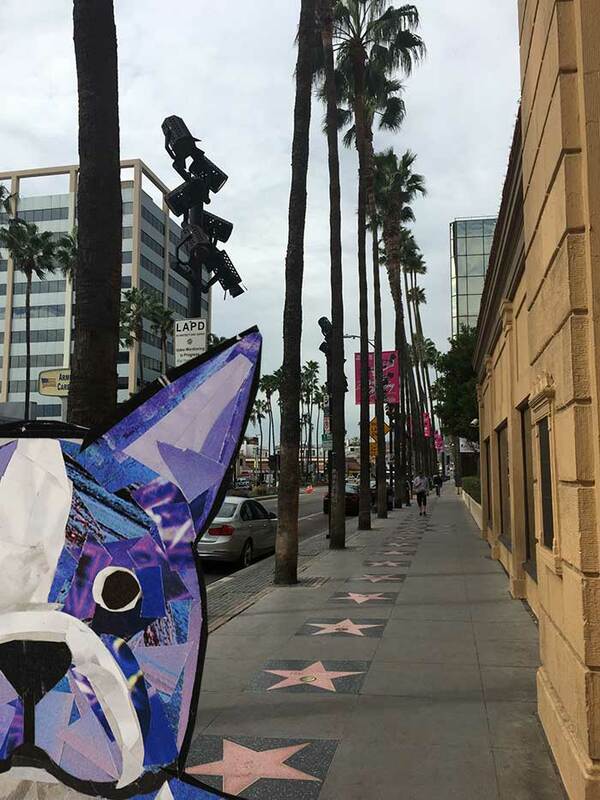 Bosty was really in the Hollywood spirit, so he decided to walk on the stars along the Hollywood Walk of Fame. 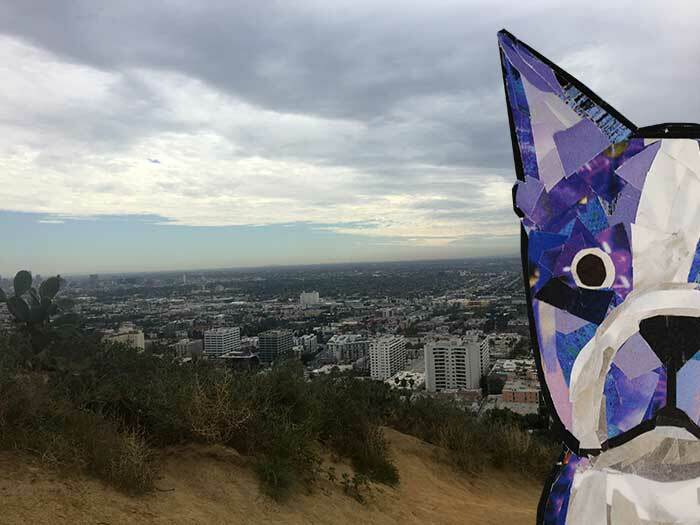 All that walking inspired him to go on a hike at Runyon Canyon, where he could check out gorgeous views of the city. Next up? Griffith Observatory where he could continue to take in beautiful views of the cityscape. 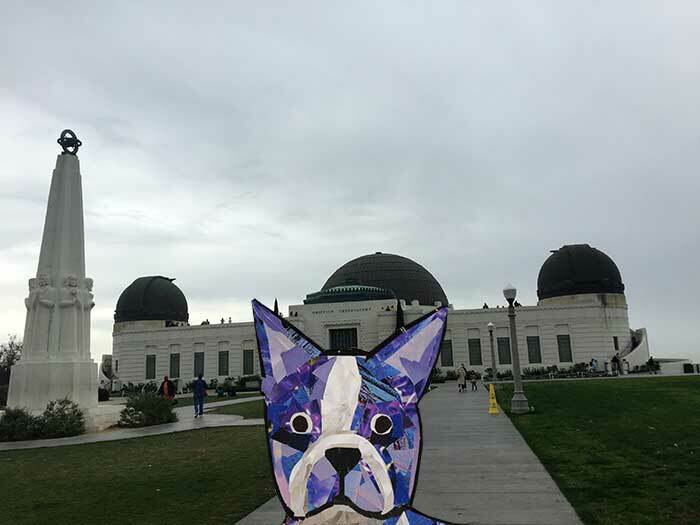 He decided to hike around the Griffith Observatory and was pleased to see this sign. 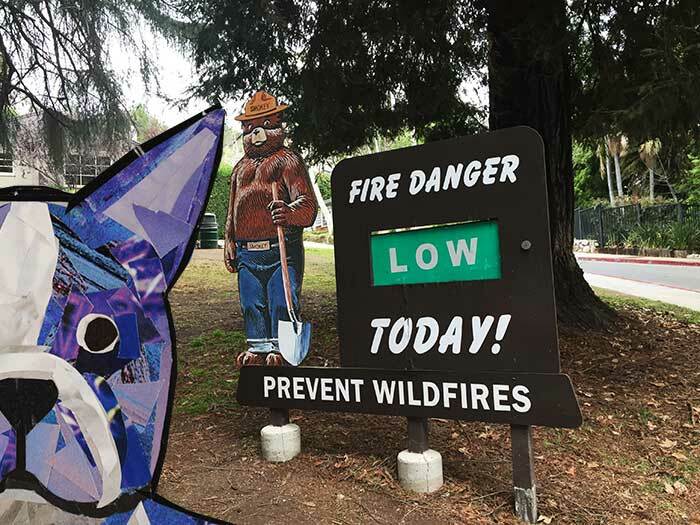 Good to know that the fire danger is low today, Smokey the Bear! 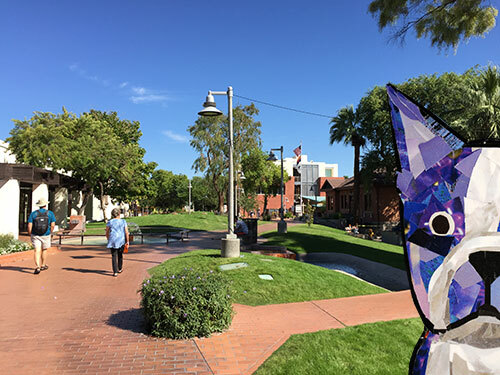 Time sure does fly when you wander the city! 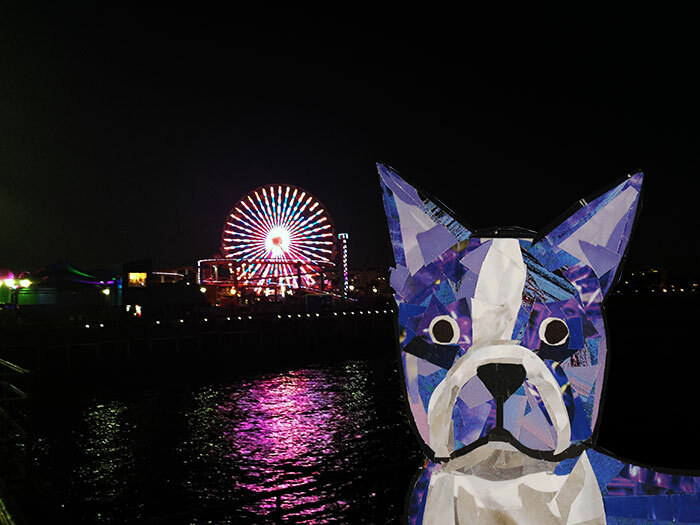 It started to get late so Bosty wanted to check out the sunset at Santa Monica Pier. 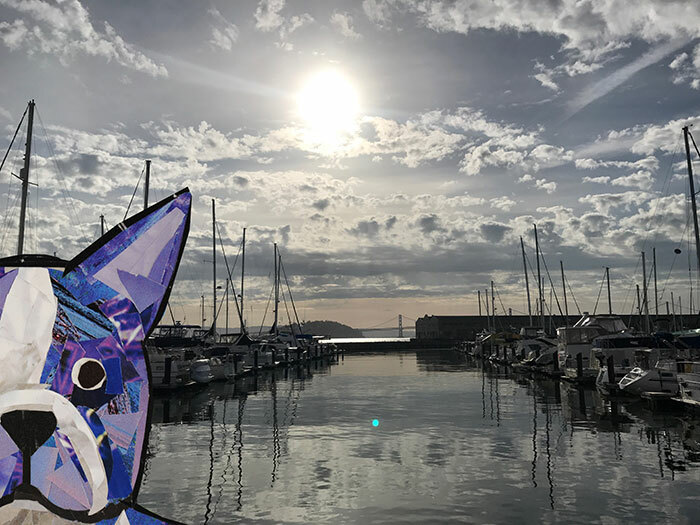 Wow, just look at that sky! And since he was already by the pier, why not go on a few carnival rides? Don’t mind if I do! Before long, it was time to head home. 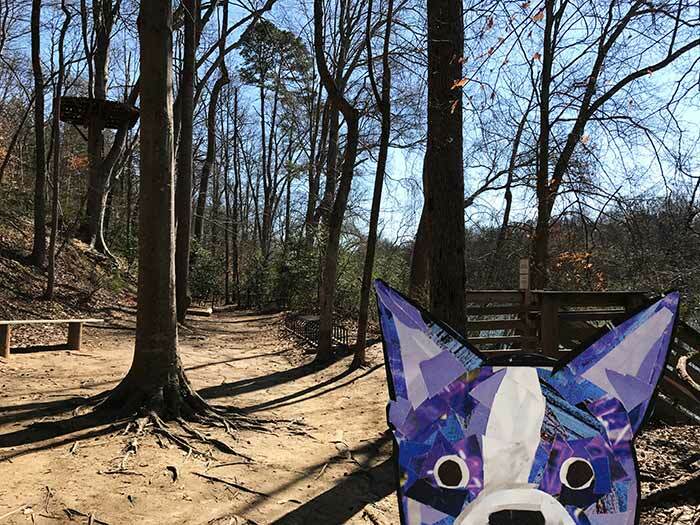 Bosty was going to miss that warm weather, but it gave him an idea of some other warm places he’d like to visit soon. 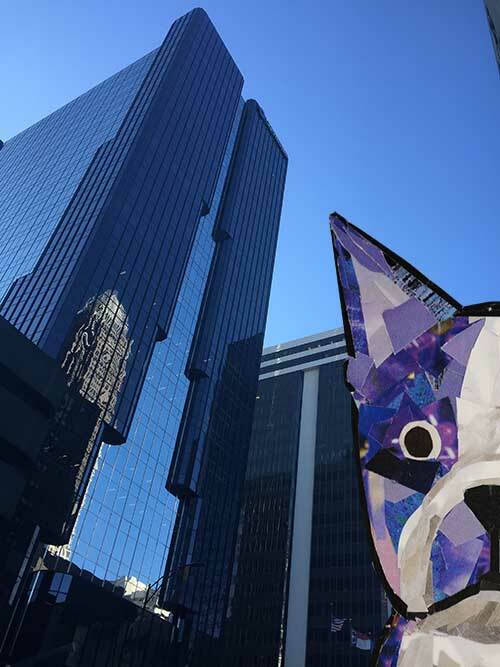 Bosty decided to visit New York City again to get a better look at all the city lights. 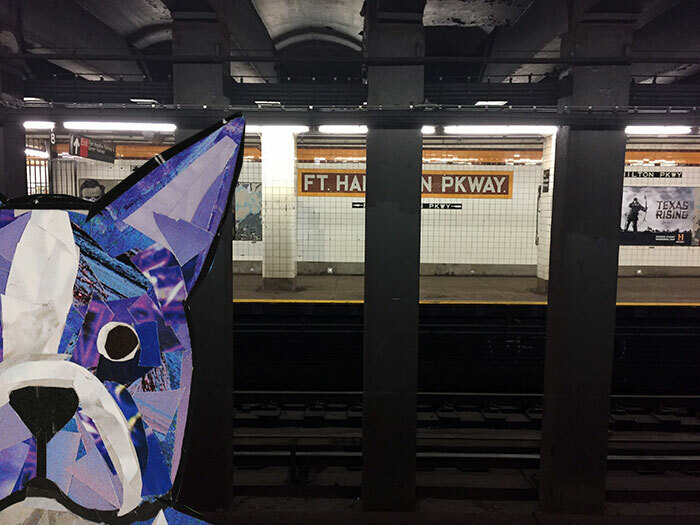 He also wanted to ride the subway more and do some serious people-watching. And take a look at all the unusual sculptures and plant-life. 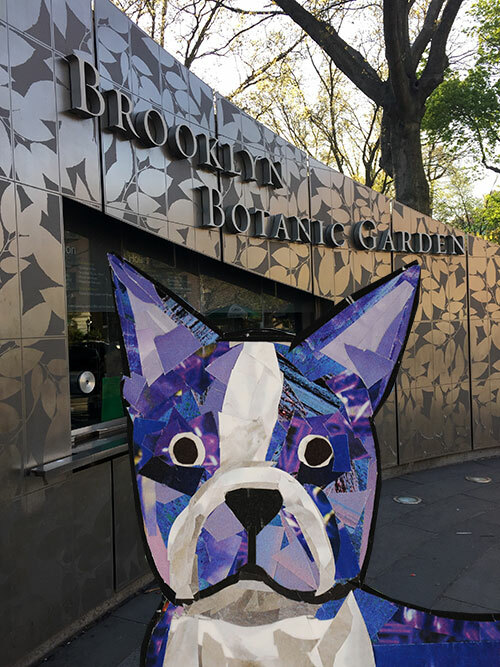 Next up he wanted to see the flowers in full bloom at the Brooklyn Botanic Garden. 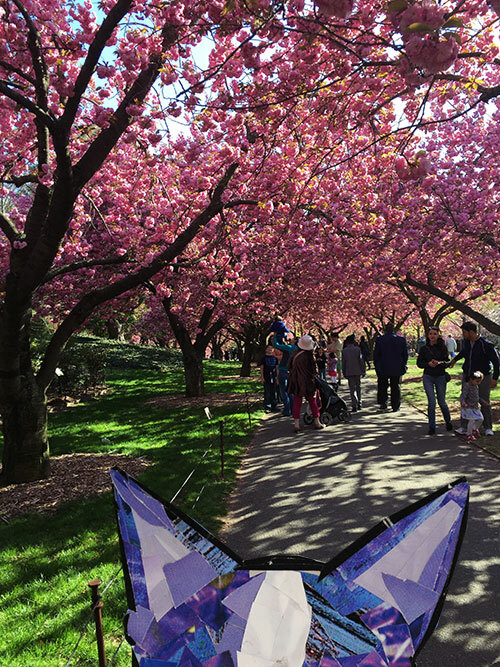 They really were in full bloom! 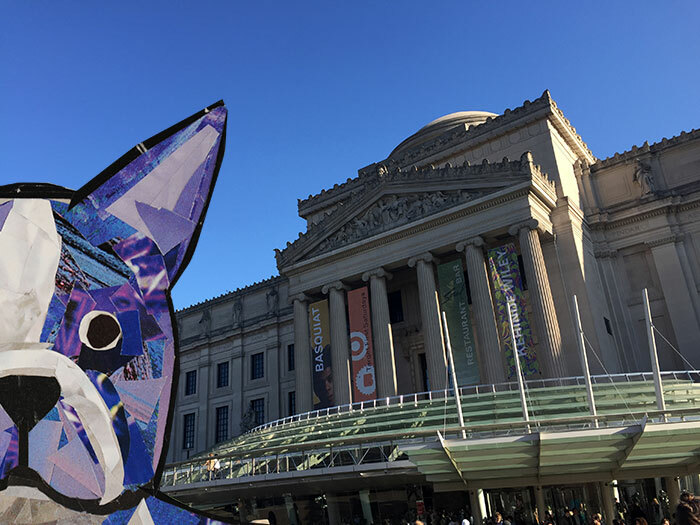 Then he stopped by the Brooklyn museum for some culture for the day. 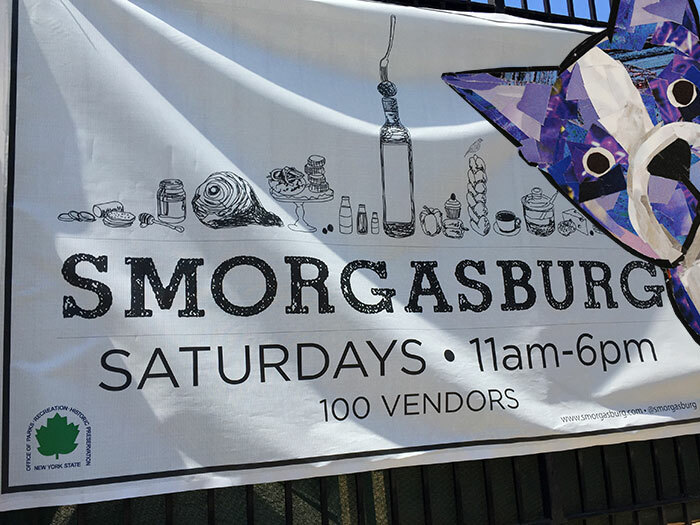 Bosty started getting hungry so he headed off to Smorgasburg in Williamsburg for a quick bite to eat. He actually had quite a bit to eat, so it wasn’t exactly a “quick” bite. But he did have a chance to have a picnic by the water with his tasty treats. 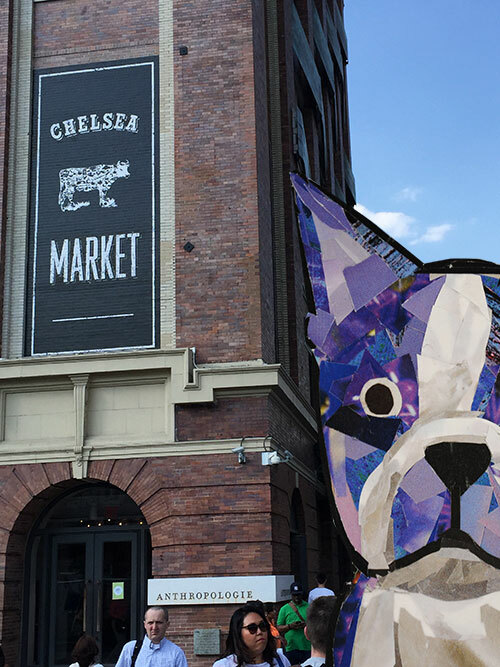 He wandered all the way to Chelsea to check out Chelsea Market. Perhaps it’s dessert time? 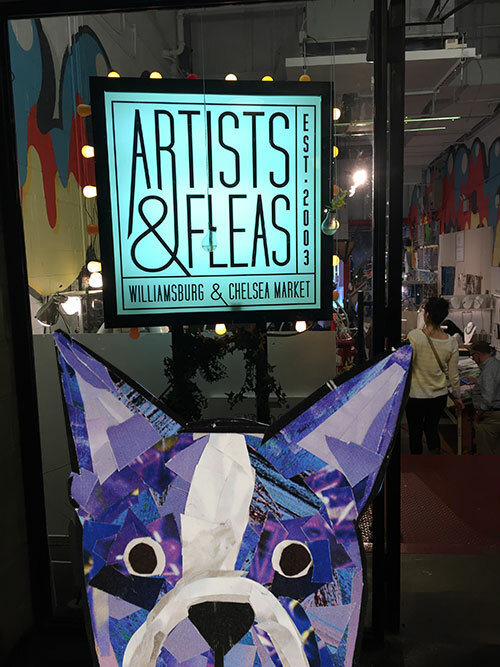 But Bosty decided to pick up a few New York souvenirs at the Artists & Fleas shop. 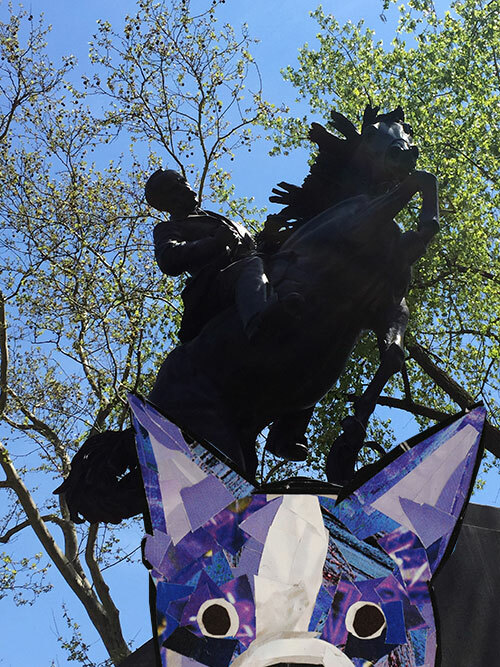 To end his incredibly busy day, he headed over to Central Park for a stroll. 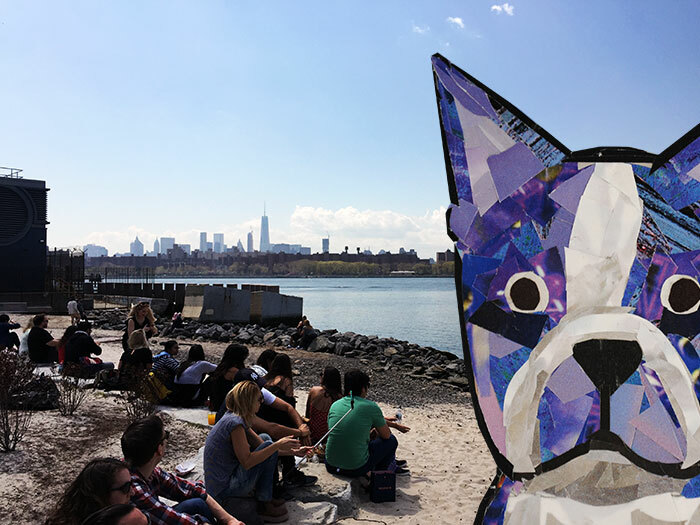 It’s been fun, New York – we’ll have to do this again sometime! 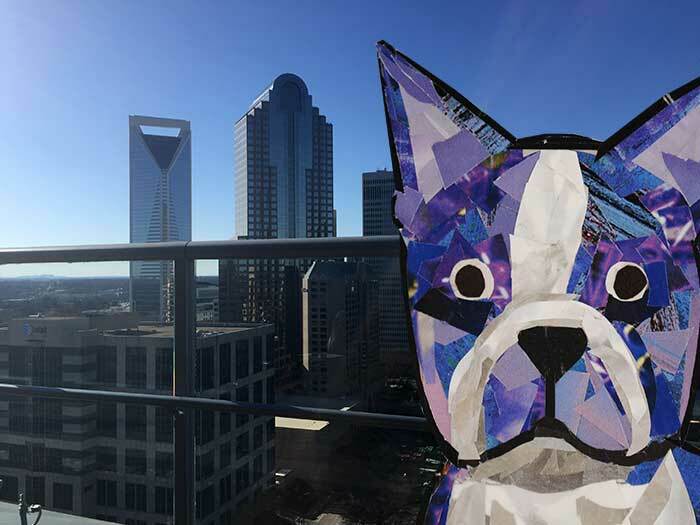 Bosty decided to escape the cold, spring weather in DC and head off to Charlotte, North Carolina. 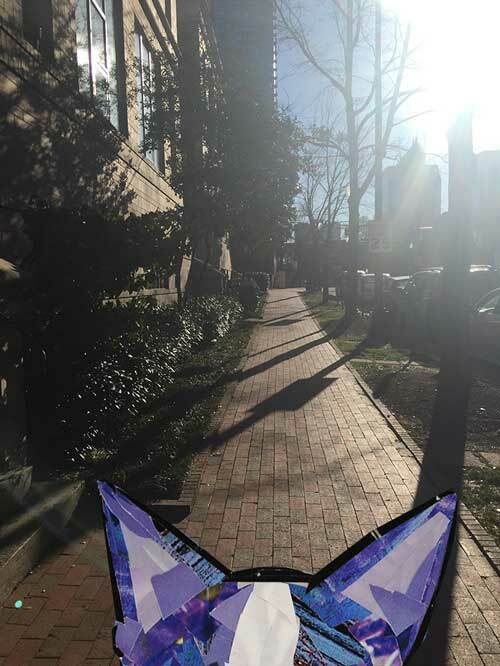 He caught some rays of sunshine while strolling around the city. And really enjoyed taking a moment to take in that skyline. 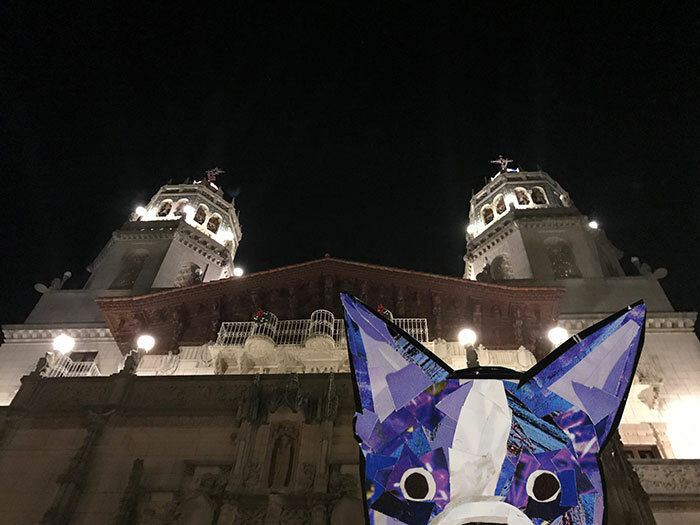 He liked looking at the architecture and buildings from afar so much that he insisted we get up-close to a few of them. 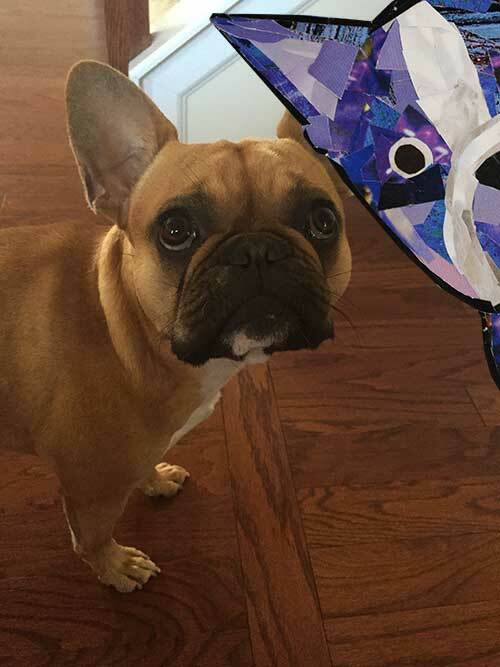 Before heading back to the cold city up north, he had a chance to play with Maddie the French Bulldog. Or was he just keeping an eye on her? 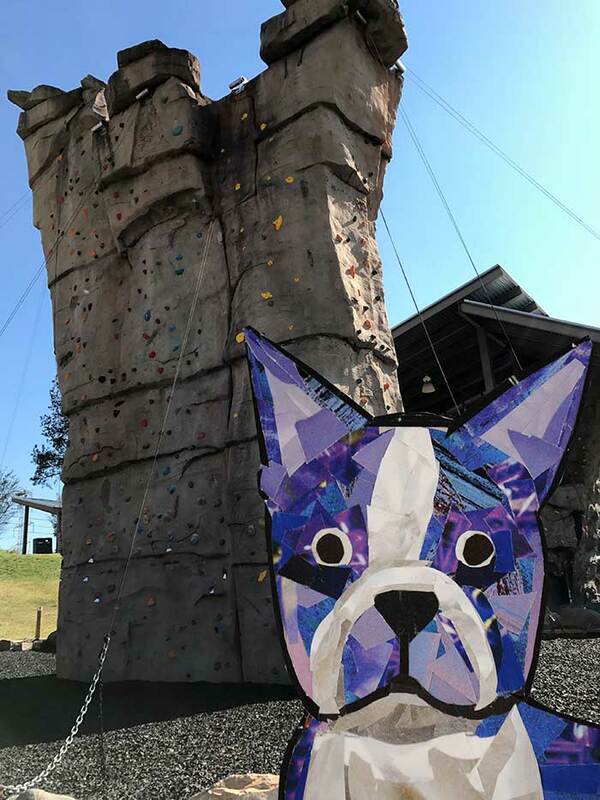 Bosty has been spending a lot of time in Arizona these days. He figures D.C. weather gets too cold this time of year, so it’s nice to take a trip to a warmer climate. 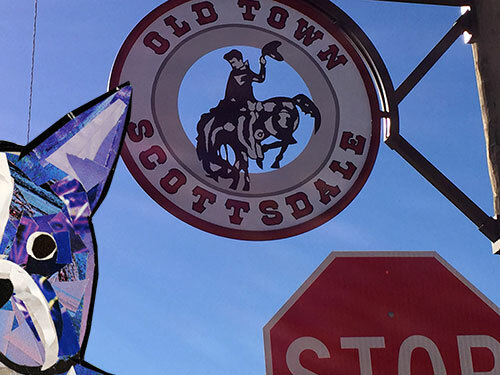 We wound up in Phoenix, Arizona – and since Phoenix is so close to Scottsdale, we made sure to stop by Old Town Scottsdale. The exhibit had a beautiful walkway. 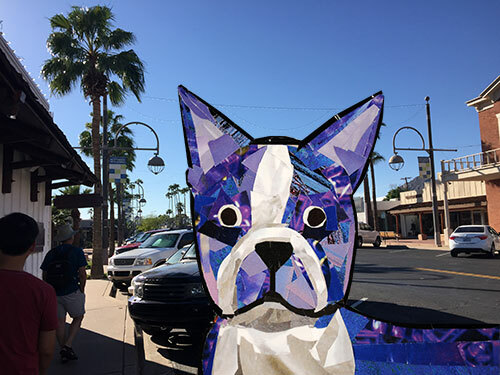 Bosty just had to get his picture taken all around the art display…. 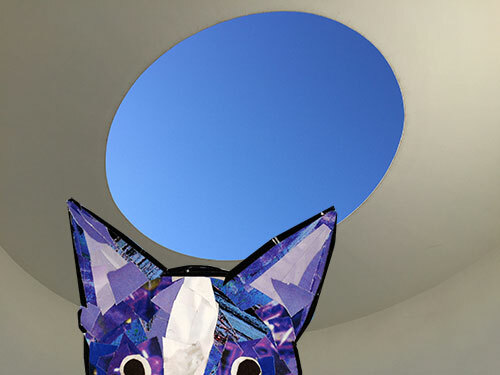 Including a room that had an oval cut out in the ceiling so you could gaze at that inredibly blue Arizona sky. 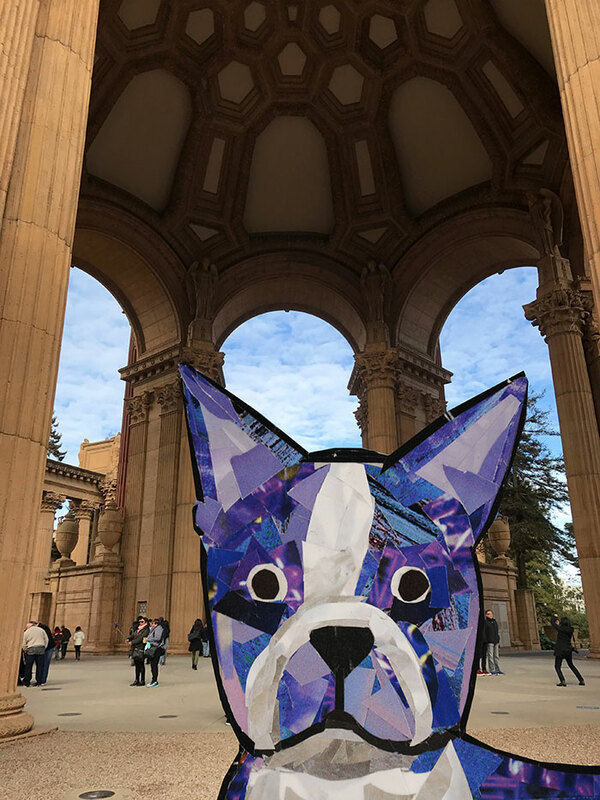 After spending plenty of time staring at art, we were off on another walk around town. I wonder where we’ll end up next? 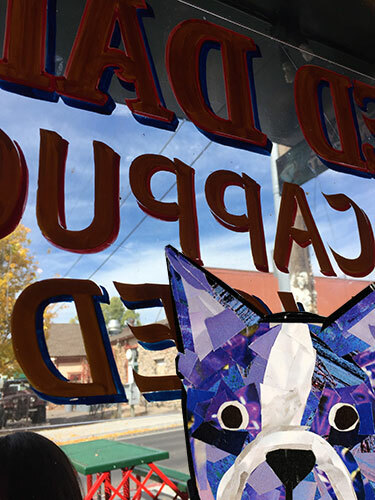 Bosty decided to start the day off in Flagstaff, Arizona by getting a cup of mocha from Macy’s European Coffeehouse. 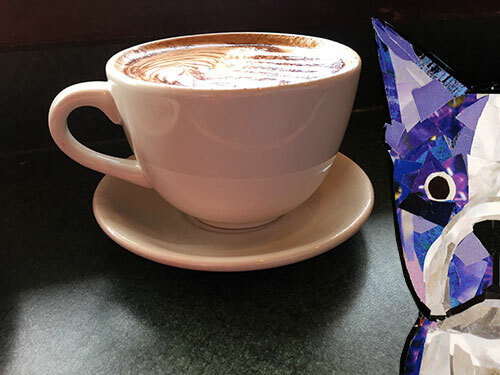 He liked people watching out the window while sipping his coffee. Next we did some wandering around the area, and did a little window shopping. 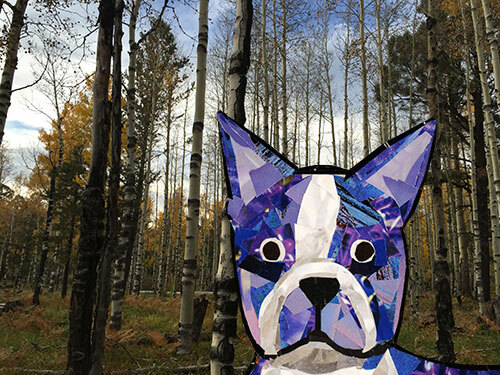 Bosty was anxious to see more of Mother Nature, so we hiked a few trails to take a look at the aspens. 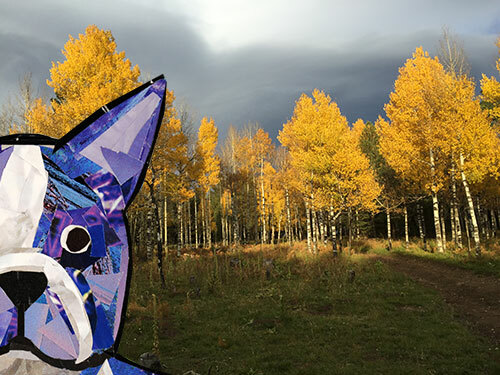 The aspens sure looked beautiful all dressed up in yellow. Before long, it was getting late and the sun began to set. 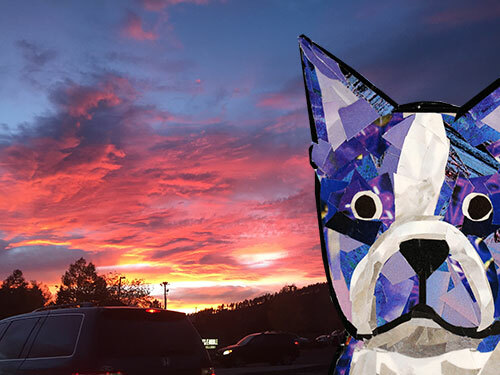 Bosty liked staring at the Arizona sunset – so colorful! It was another day full of activity. 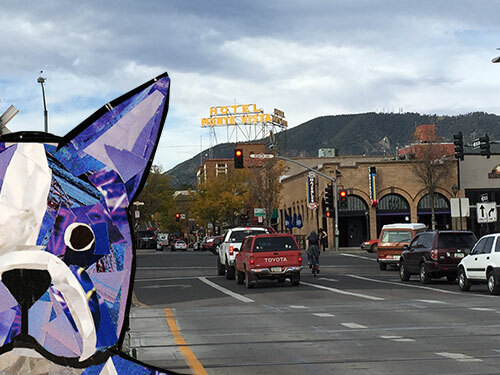 Bosty isn’t ready to leave the area just yet – he has some ideas of other cities to visit out west.